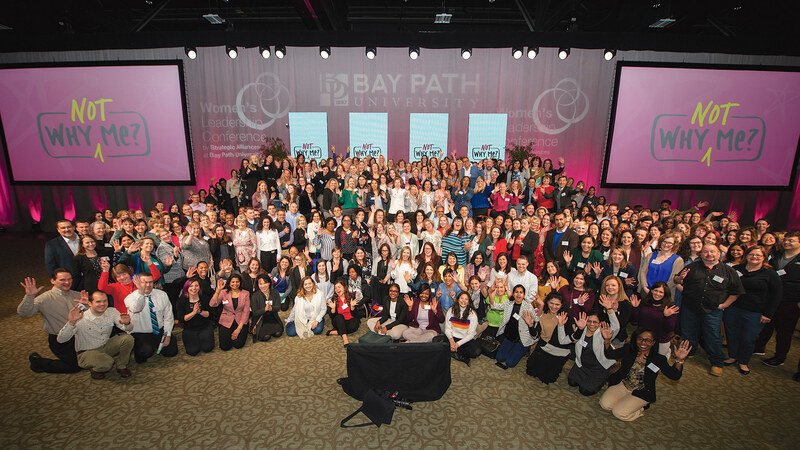 Bay Path University staged its annual Women’s Leadership Conference on March 29. 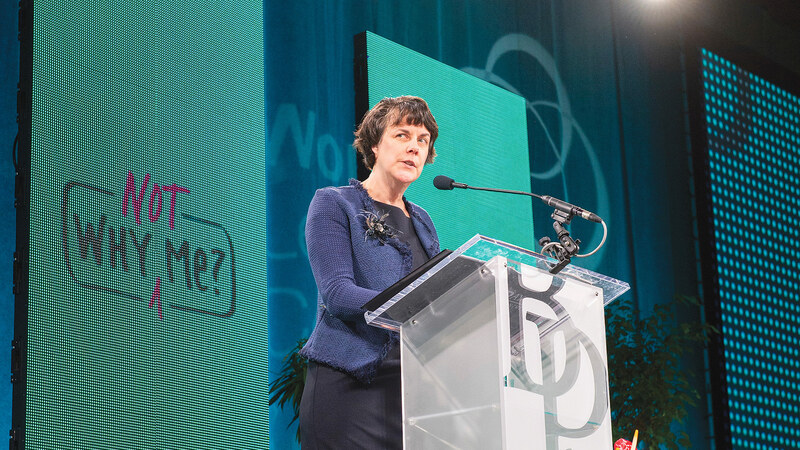 The theme for the day was “Why Not Me,” and a number of keynote speakers and focus sessions addressed that broad topic. 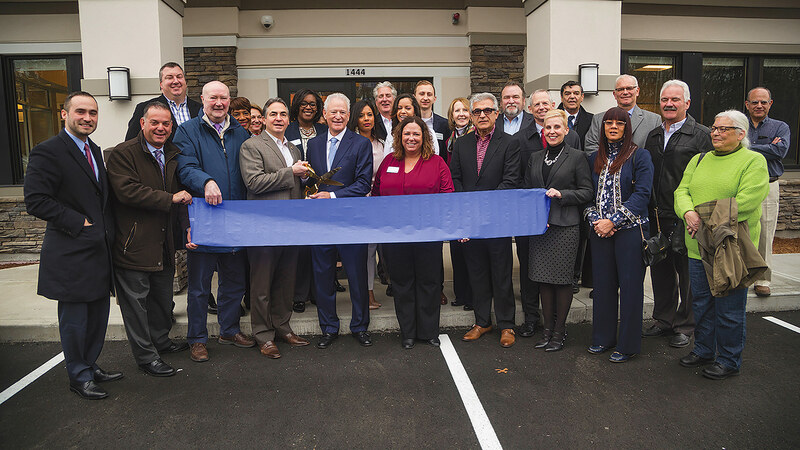 Ribbon-cutting ceremonies were conducted on April 5 for a new medical/professional building at 15 Atwood Dr. in Northampton, a project led by Development Associates and Northwood Development, LLC. 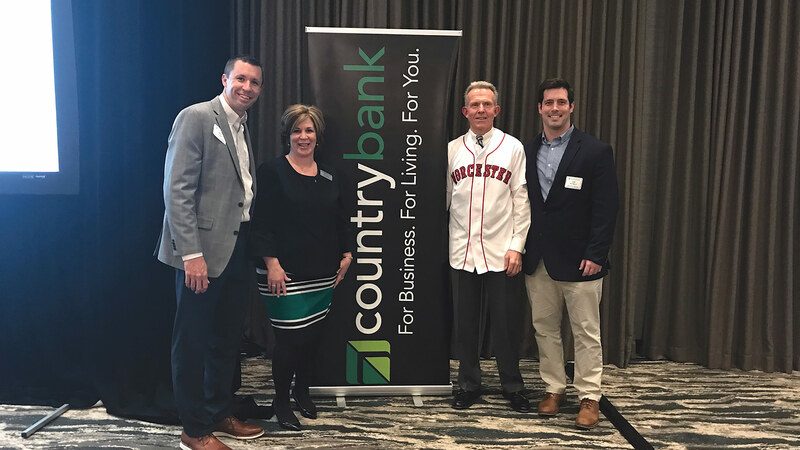 As part of its ongoing Worcester expansion, Country Bank is teaming up with the Worcester Red Sox as one of the team’s 21 founding partners in anticipation of its move to Worcester in 2021. 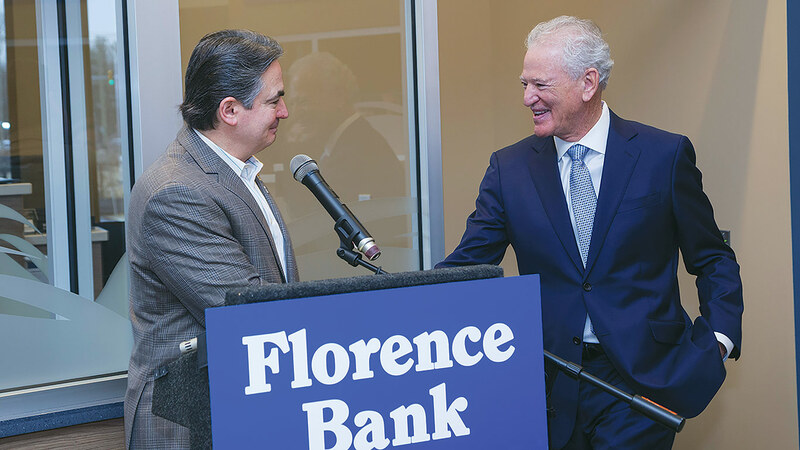 The bank’s recent annual annual meeting in Worcester featured a keynote address that included a video of the site of Polar Park narrated by Worcester Red Sox President Charles Steinberg, along with remarks regarding the team’s decision to relocate to Worcester. 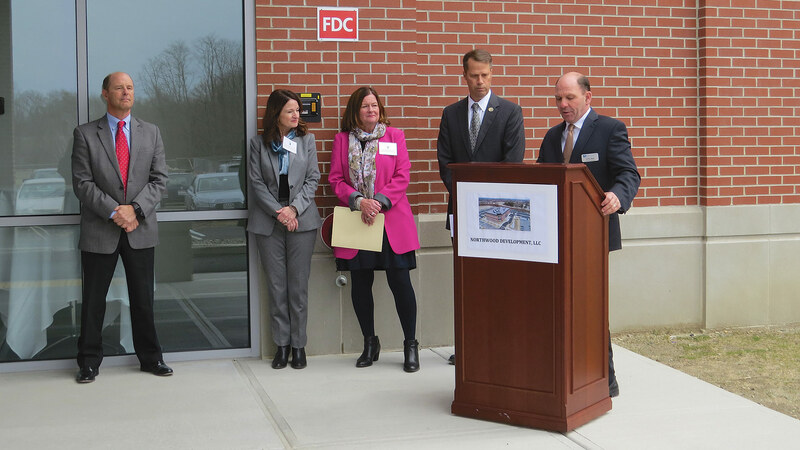 Pictured, from left, are Rob Crain, senior vice president of Marketing for the Worcester Red Sox; Shelley Regin, senior vice president of Marketing for Country Bank; Paul Scully, President and CEO of Country Bank, and Jack Verducci, vice president of Corporate Partnerships for the Worcester Red Sox. 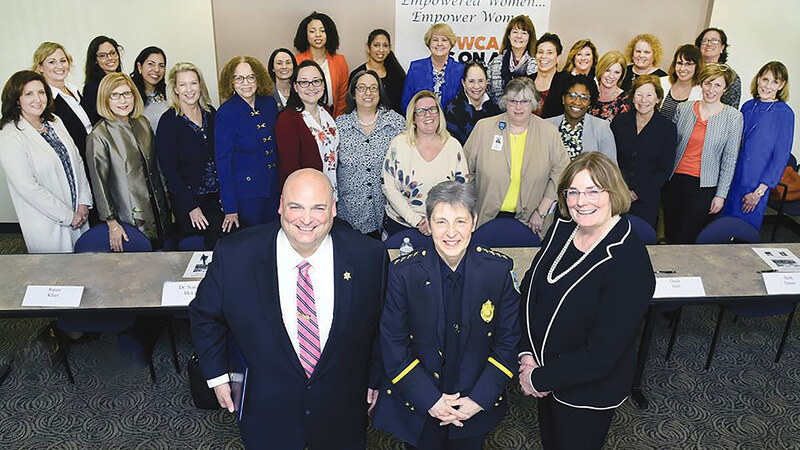 The YWCA of Greater Springfield recently hosted a somewhat unusual, but important gathering — a show of support for Cheryl Claprood, the recently named acting police commissioner in Springfield, a role she assumes at a time of considerable controversy within the department. 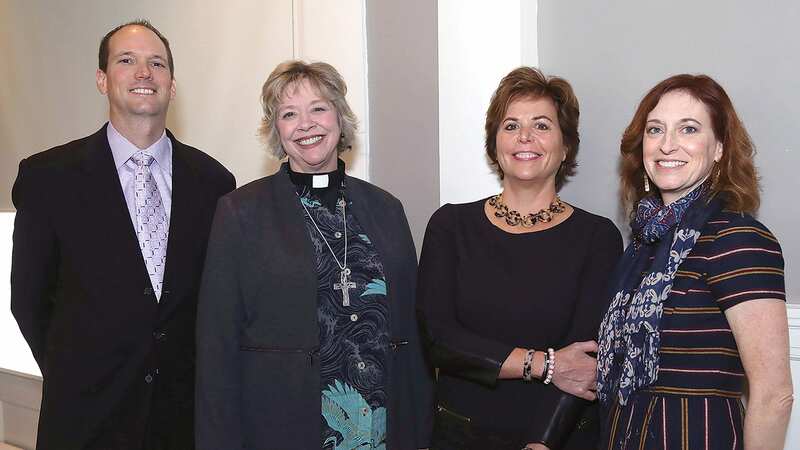 Elms College recently received a visit from the Earl of St. Andrews, a senior member of the House of Windsor, the reigning royal house of the United Kingdom. 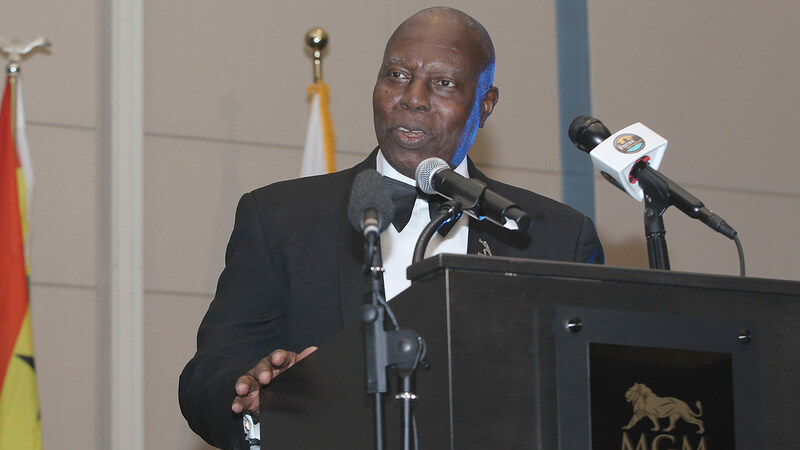 George Philip Nicholas Windsor, Earl of St. Andrews, is the elder son of Prince Edward, Duke of Kent, and his wife Katharine, Duchess of Kent. He holds the title Earl of St Andrews as heir apparent to the Dukedom of Kent. 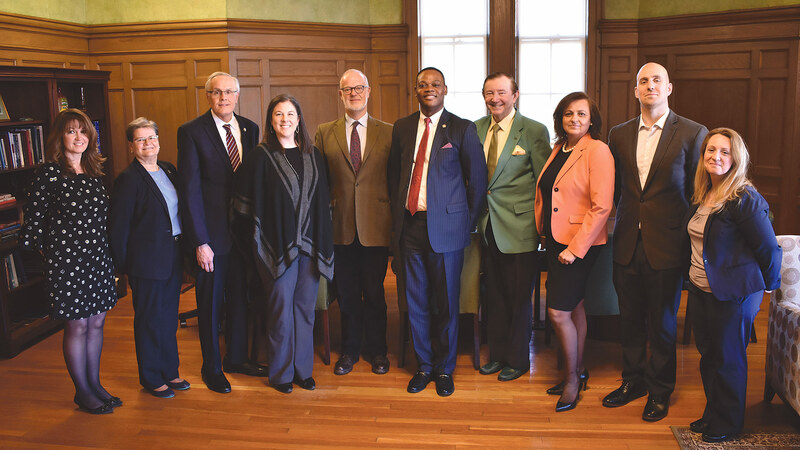 The earl stopped by Elms College on his way through Springfield to attend a conference on the Middle East in Washington, D.C., later this week. 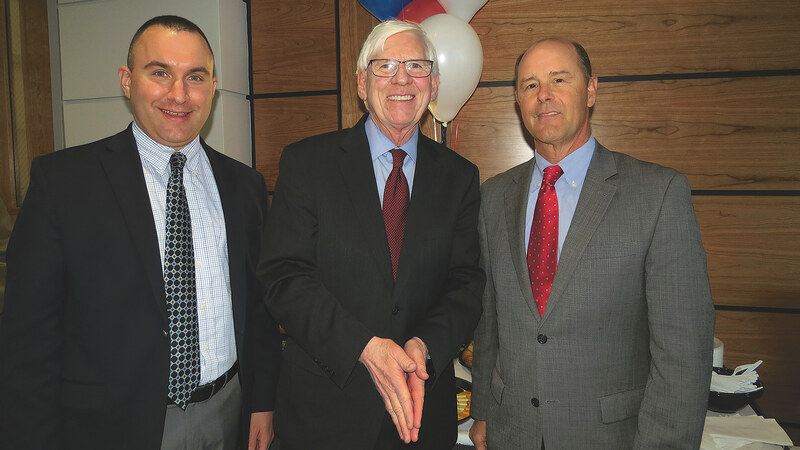 The conference was co-sponsored by the Next Century Foundation, where he serves as a trustee with retired ambassador Mark Hambley, who is also a trustee of Elms College. 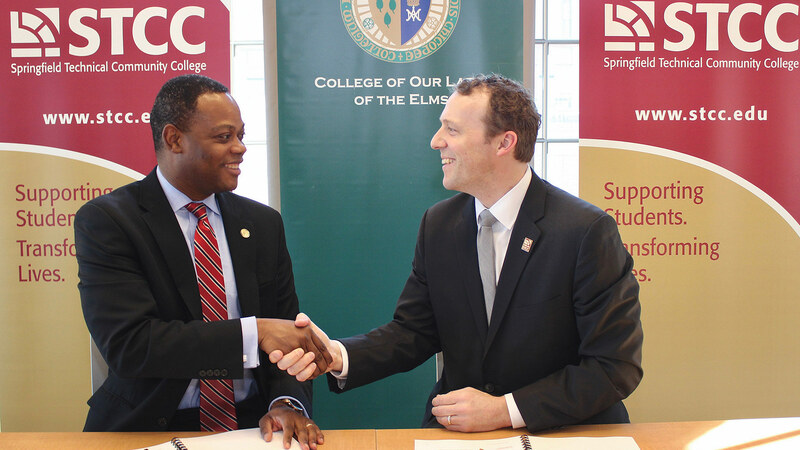 Elms College President Harry Dumay, left, and Springfield Technical Community College President John Cook shake hands after signing a partnership agreement to offer accelerated online degree-completion programs in Computer Science and Computer Information Technology and Security. 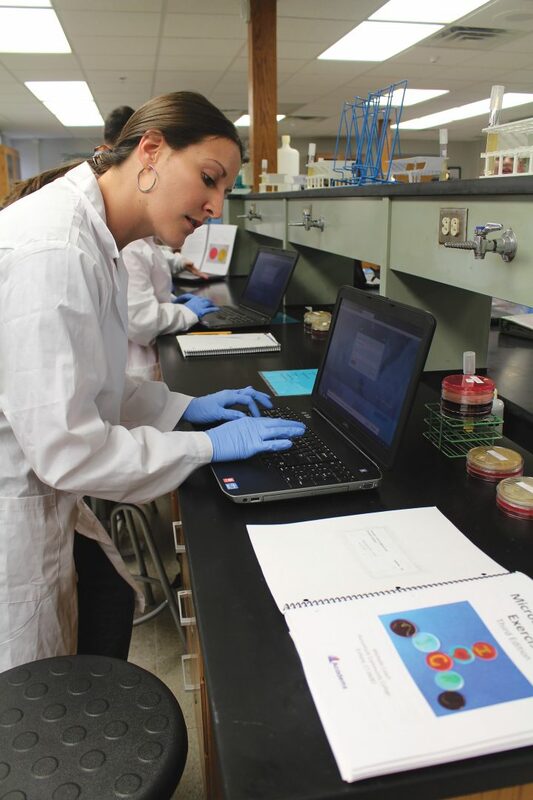 The bachelor’s degree programs are completely online and accelerated, which means students can earn their degree in 14 months after obtaining an associate degree from STCC. 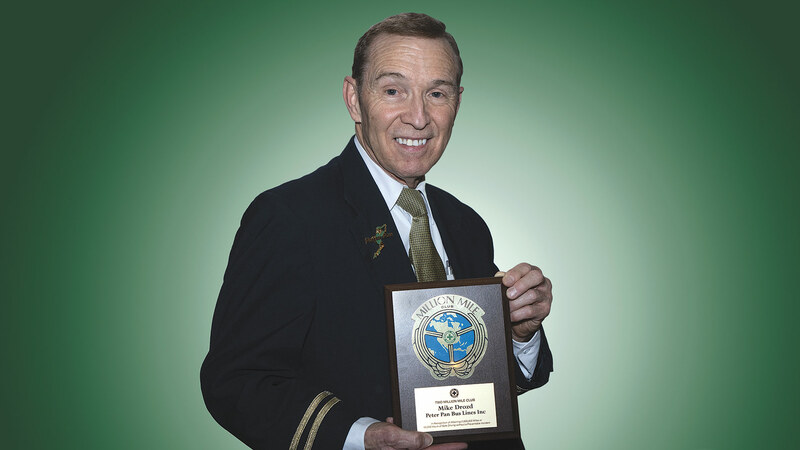 Peter Pan Bus Lines recently hosted its annual Safety Awards presentation at the Student Prince and the Fort. 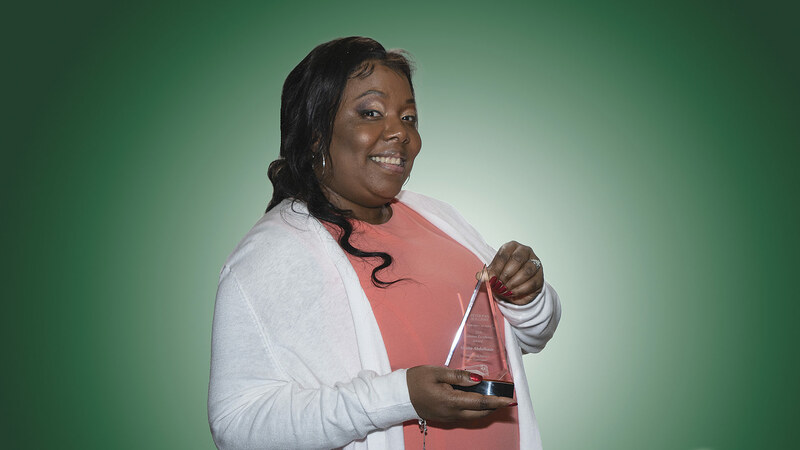 A total of 175 drivers were recognized for completing 2018 with no accidents, and the company also recognized drivers, operations, and maintenance departments for outstanding customer service and performance. 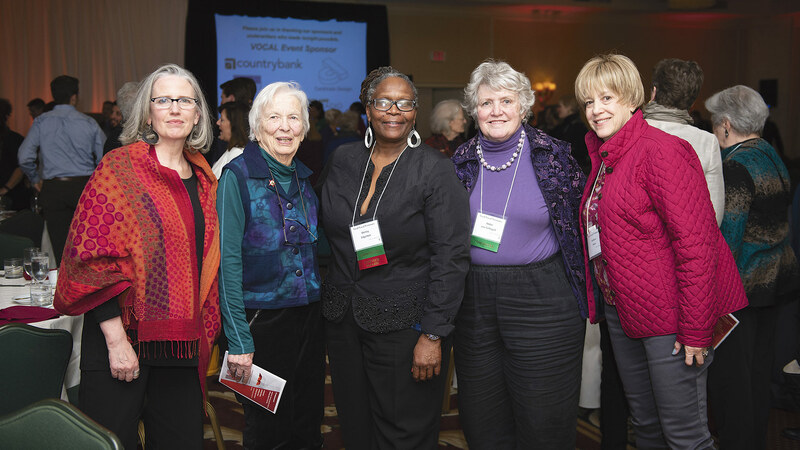 The Women’s Fund of Western Mass. 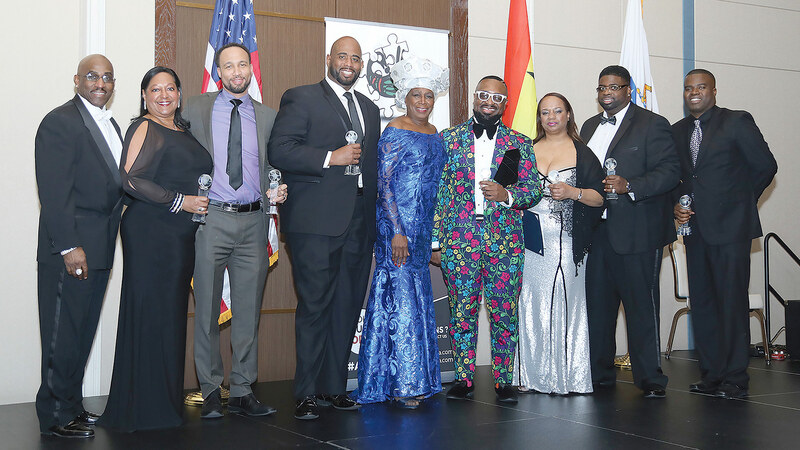 (WFWM) paid tribute to four of its pioneers at an event it called Vivid Vocal Visionary on March 18 at the Tower Square Hotel in Springfield. 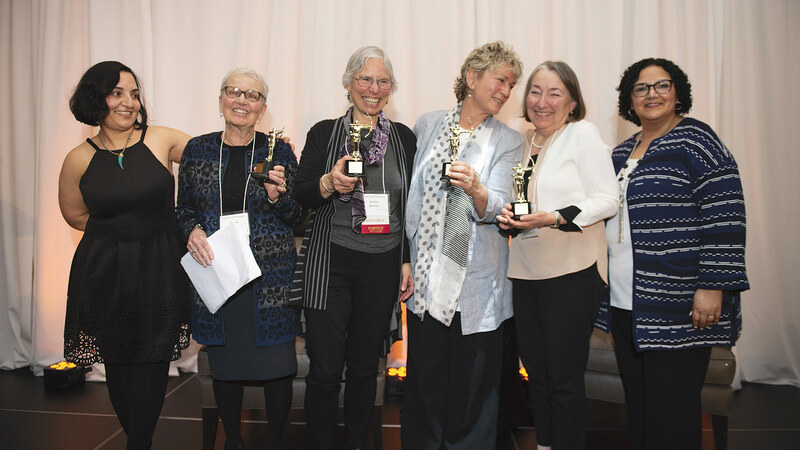 The event honored the group’s three founders, Dianne Fuller Doherty, the late Sally Livingston, and Martha Richards, as well as its founding executive director, Kristi Nelson. 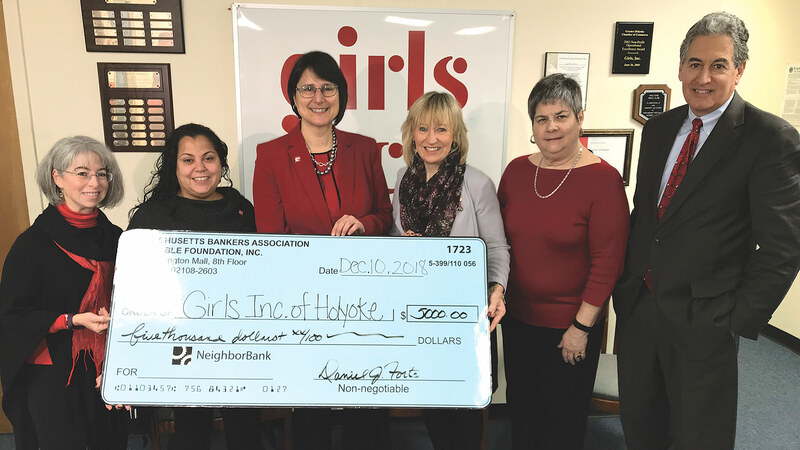 Girls Inc. of Holyoke officially changed its name to Girls Inc. of the Valley last month to reflect its broader reach — it now serves girls in several communities across the region — and deeper impact. 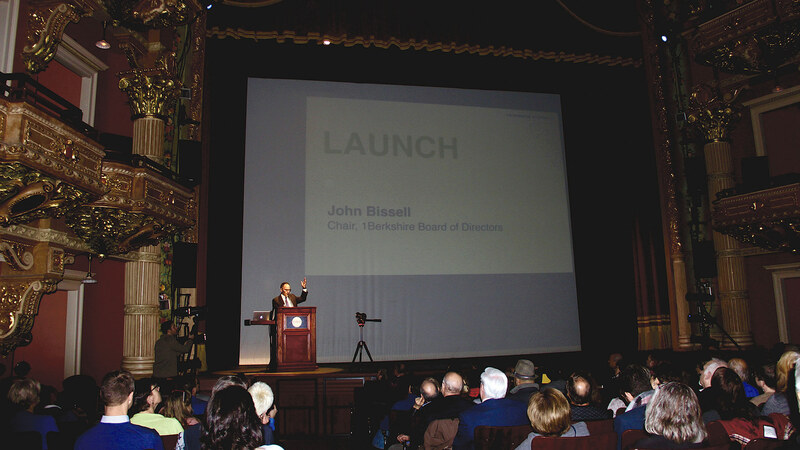 The name change was announced at a press conference at WGBY’s headquarters in Springfield that featured a number of speakers talking about the agency’s critical mission within the region. 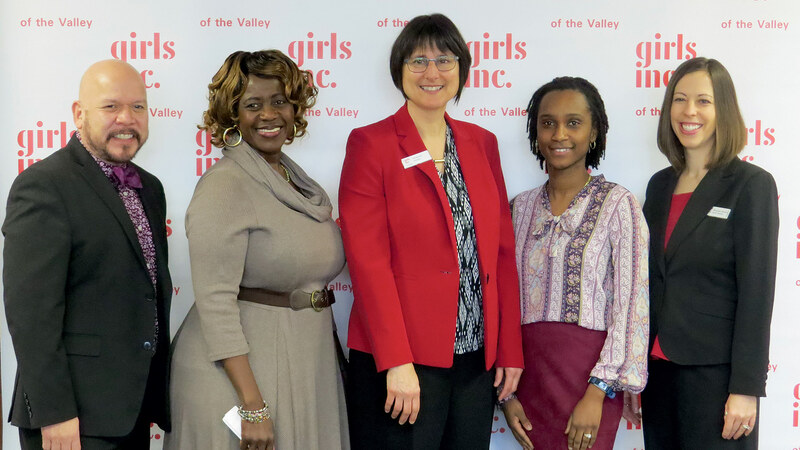 From left, Luis Soria, principal of the Marcella R. Kelly School in Holyoke; Safiatu Sam, mother of a Girls Inc. Eureka scholar who lives in Chicopee; Suzanne Parker, executive director of Girls Inc. of the Valley; Roxanne Atterbury, a teacher at Rebecca Johnson Elementary School in Springfield; and Melyssa Brown-Porter, chair of the board for Girls Inc. of the Valley. 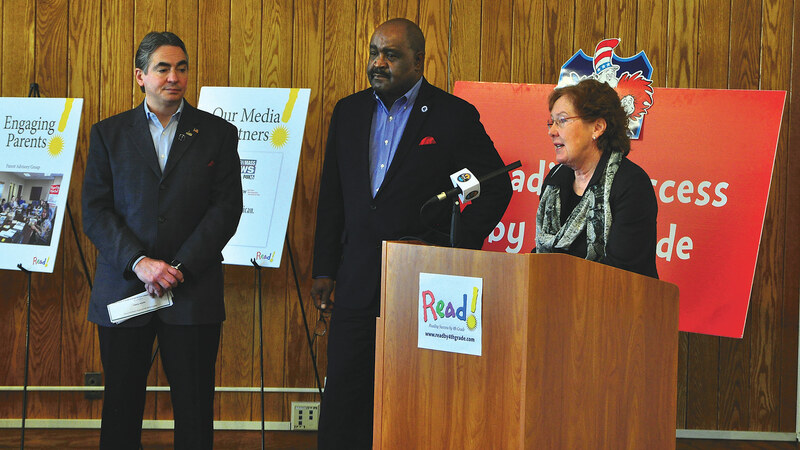 The Irene E. and George A. Davis Foundation announced late last month that the Springfield City Library will assume management of the Reading Success by 4th Grade initiative launched by the foundation in 2009 and managed by Sally Fuller until her retirement last year. 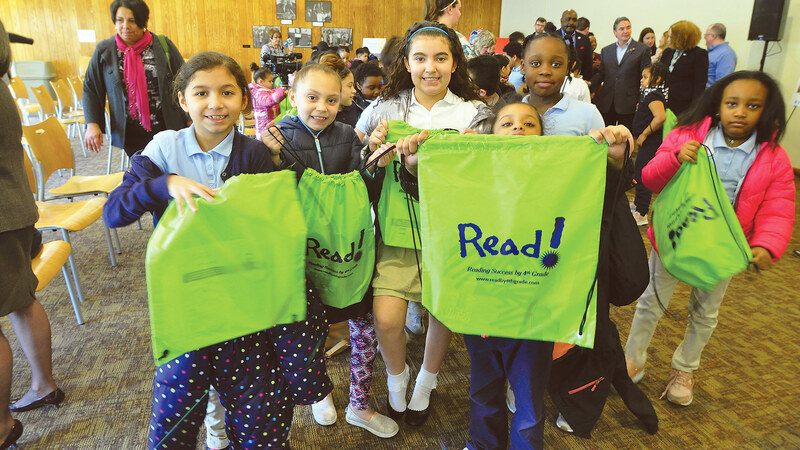 The new chapter for the initiative was announced at a press conference at the Mason Square branch of the library attended by a host of area civic and business leaders as well as third-graders from nearby DeBerry Elementary School. 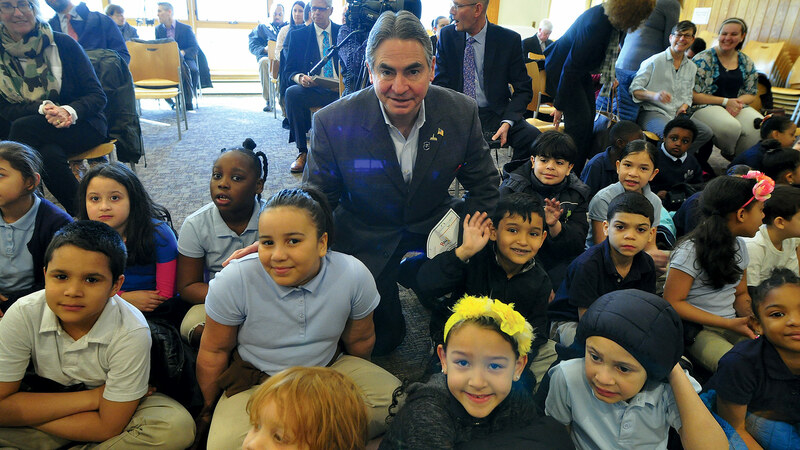 Springfield Mayor Domenic Sarno meets with several of those students. The Western Mass. 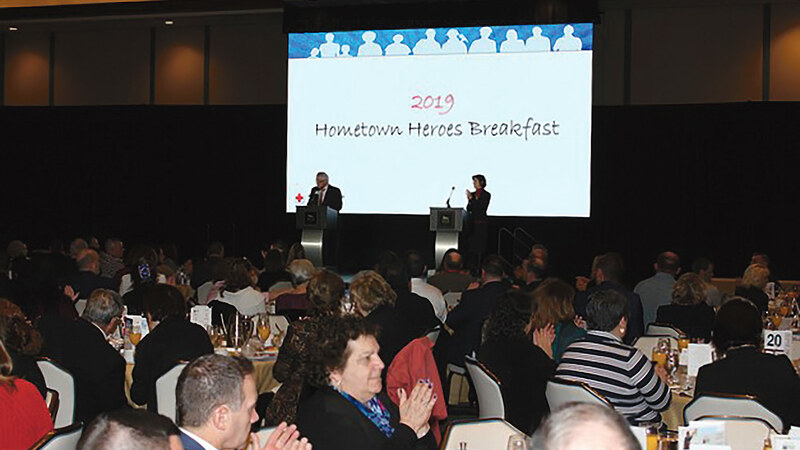 Chapter of the American Red Cross staged its annual Hometown Heroes Breakfast on March 21 at MGM Springfield. 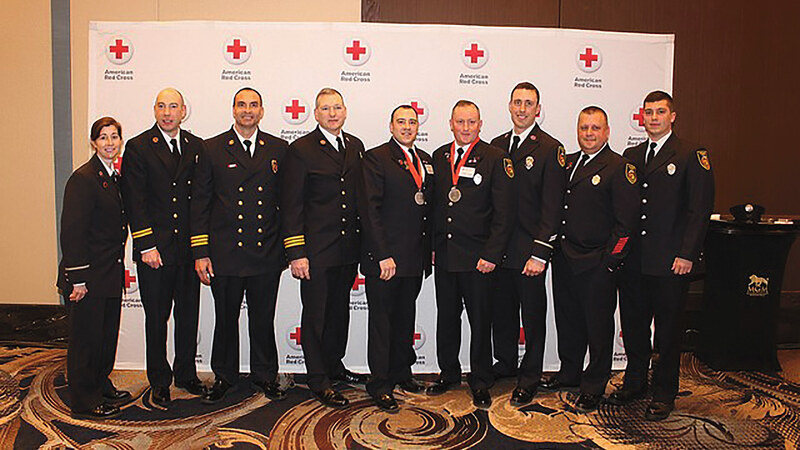 The event recognized 10 heroes from across the region. 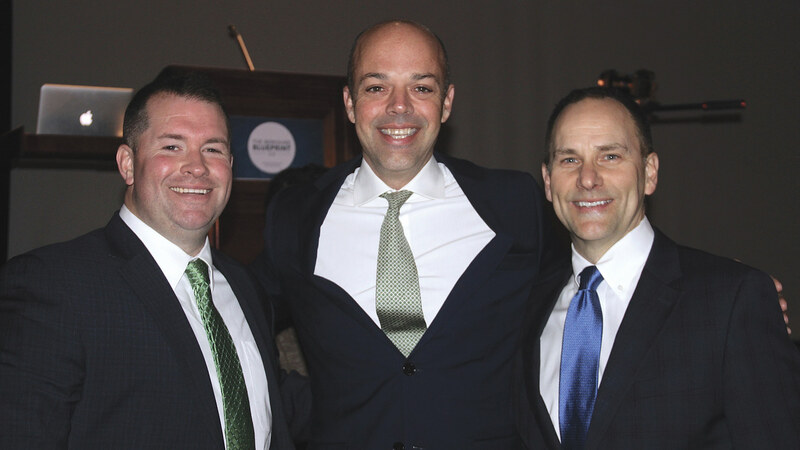 The Springfield Regional Chamber staged its annual Outlook lunch on March 4 at the MassMutual Center. 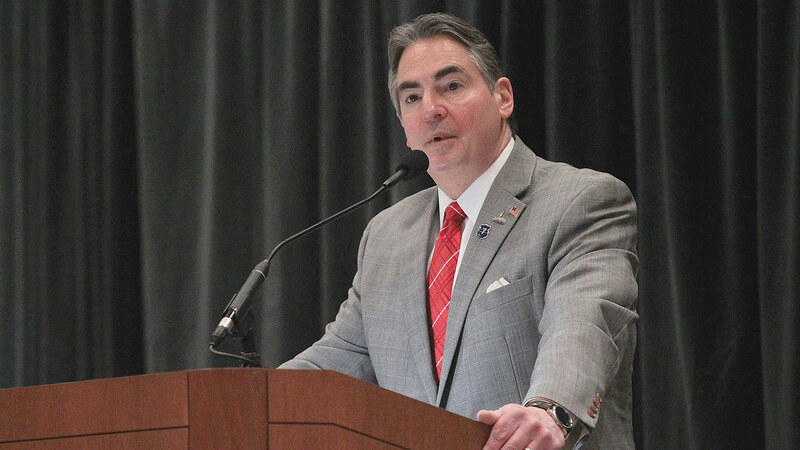 More than 600 area business leaders and elected officials heard from a number of speakers who presented the outlook for the region, the state, and the nation. 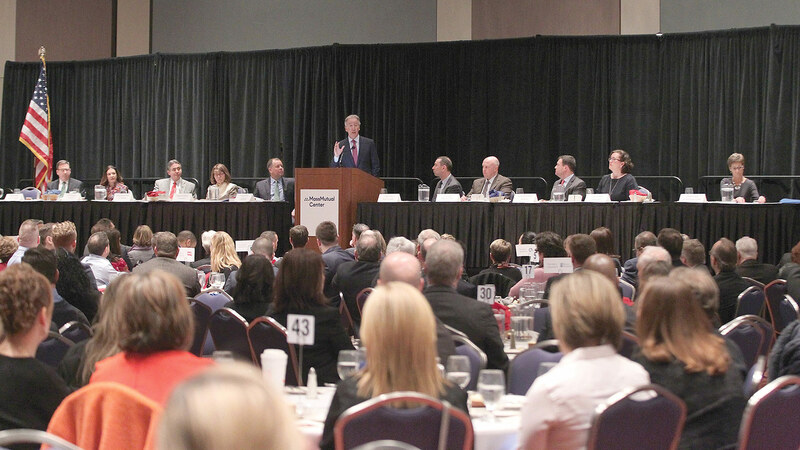 At top, U.S. Rep. Richard Neal gives the federal outlook. 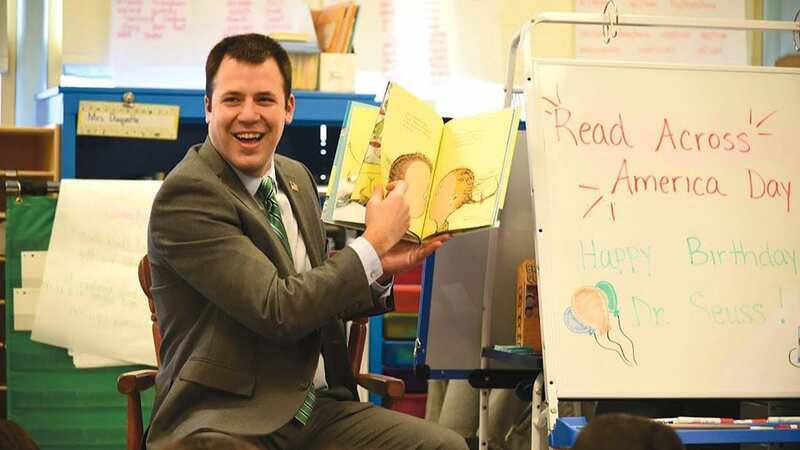 Jeb Balise, CEO of Balise Auto, right, and West Springfield Mayor William Reichelt, below, took a break from their respective duties recently to become celebrity readers at West Springfield’s Coburn Elementary School. 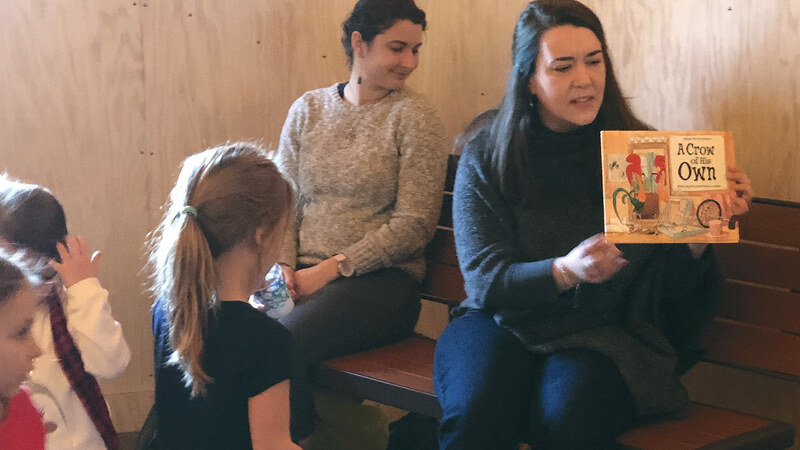 They both read The Uncorker of Ocean Bottles, written by Michelle Cuevas and illustrated by Erin Stead, to third-graders. 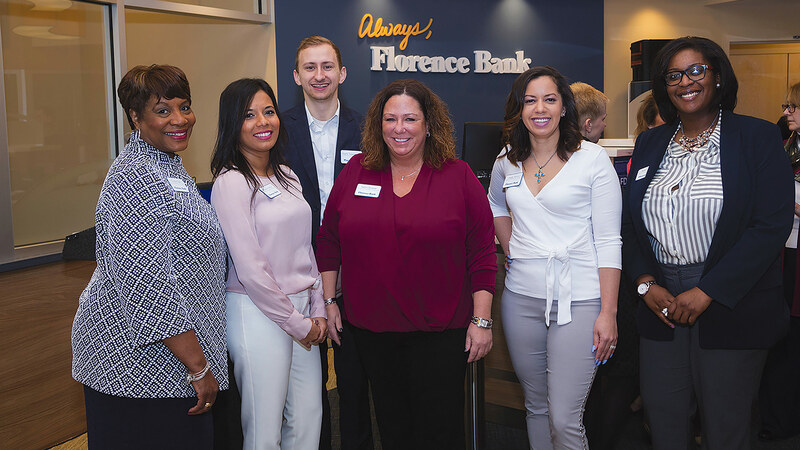 Through its Customers’ Choice Community Grants Program, Florence Savings Bank (FSB) recently presented grants totaling $102,500 to 61 area nonprofits at an awards ceremony on March 5 at the Garden House at Look Park. 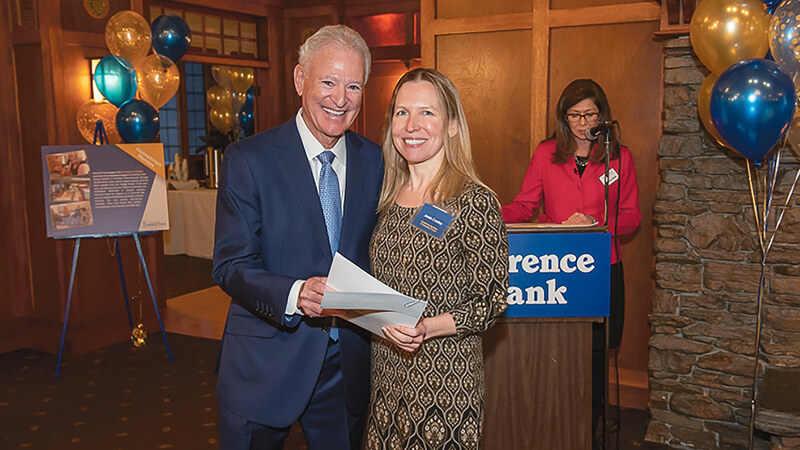 At top, FSB President and CEO John Heaps presents Jessie Cooley, director of Big Brothers Big Sisters of Hampshire County, with a $4,853 award. 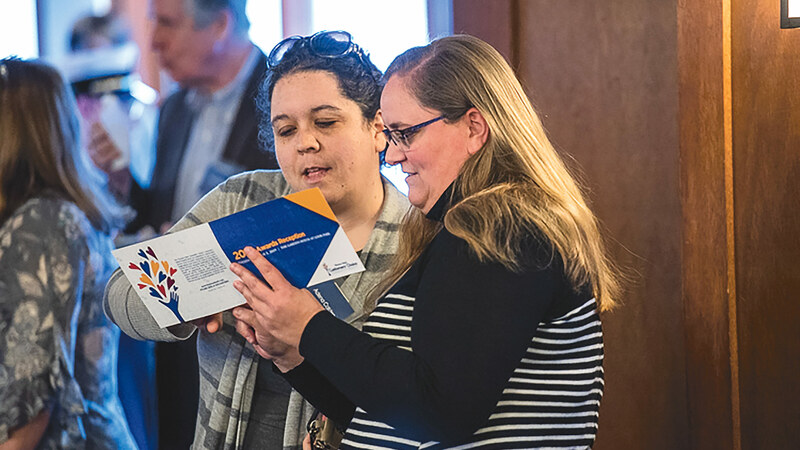 Below, Adena Calden, left, and Kate Agresto, both of the Leeds Elementary Parent Teacher Organization, read the brochure outlining the award recipients. 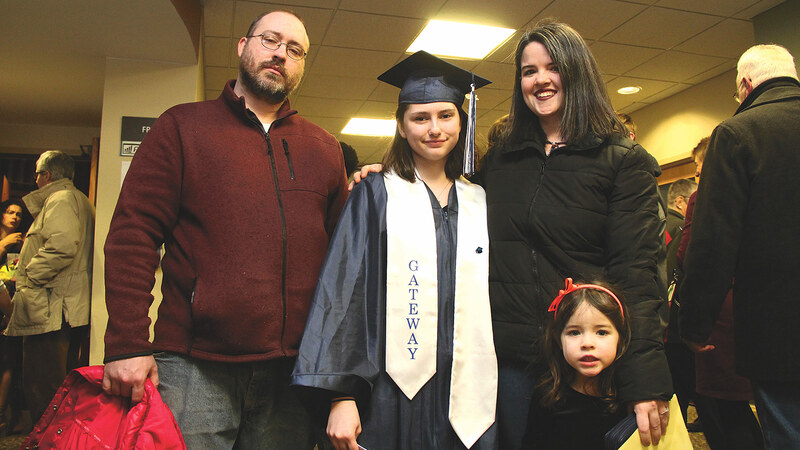 Holyoke Community College recently staged graduation ceremonies for its Gateway to College program. 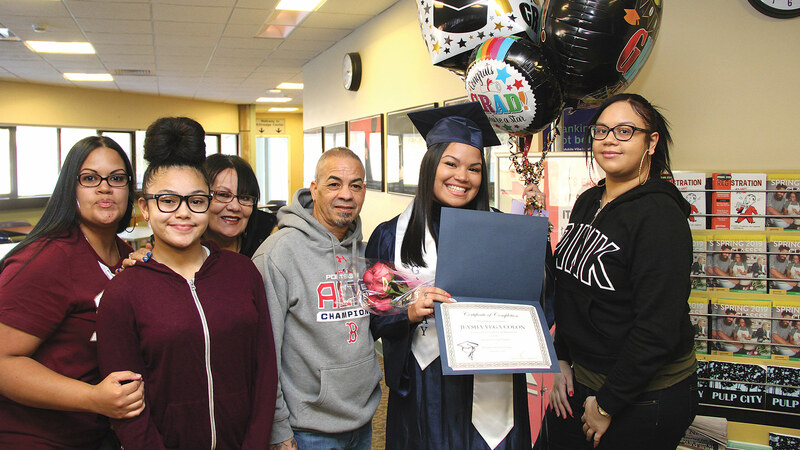 Gateway at HCC is part of a national network of programs that put struggling high-school students and dropouts into college classes, where they work toward their high-school diplomas and also collect transferable college credits. 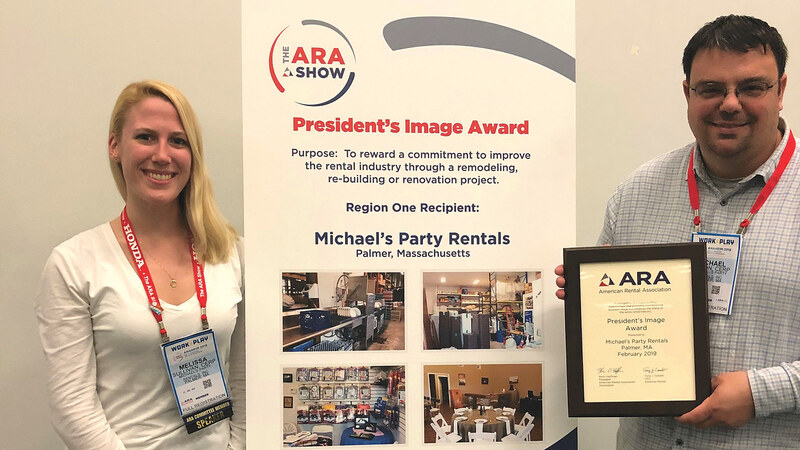 Country Hyundai in Northampton recently earned the 2019 DealerRater Dealer of the Year Award and the 2019 Consumer Satisfaction Award, which recognizes auto dealerships across the U.S. and Canada who deliver outstanding customer service, based on consumer reviews written on DealerRater.com. 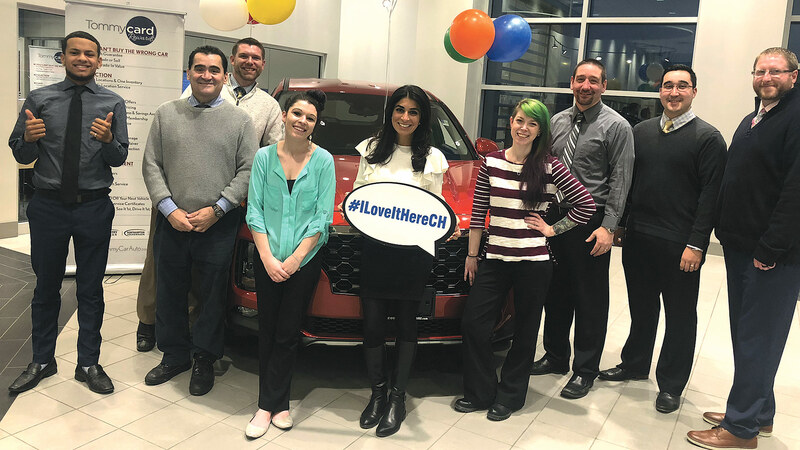 Carla Cosenzi, center, joins staff at the dealership in celebrating the honor. 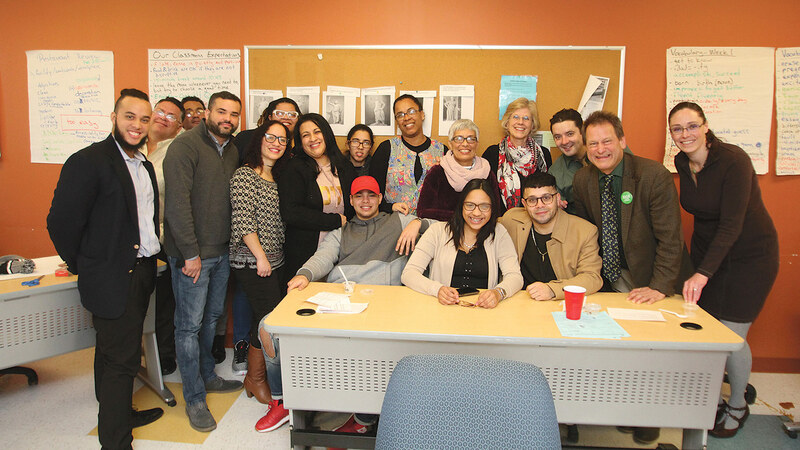 More than two dozen students were recently recognized for completing a five-month ESOL (English for speakers of other languages) program for Puerto Rican evacuees at Holyoke Community College. 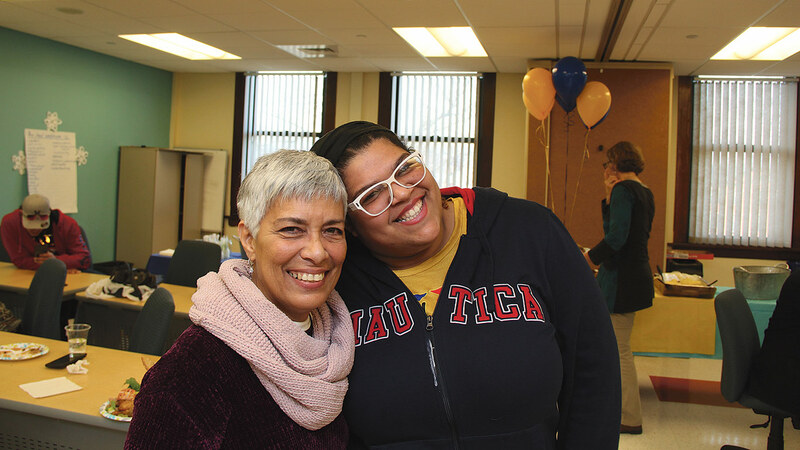 The Puerto Rican New Arrivals Program started July 23 and concluded Dec. 20 with a recognition ceremony and feast at HCC’s Picknelly Adult and Family Education Center (PAFEC) in downtown Holyoke. 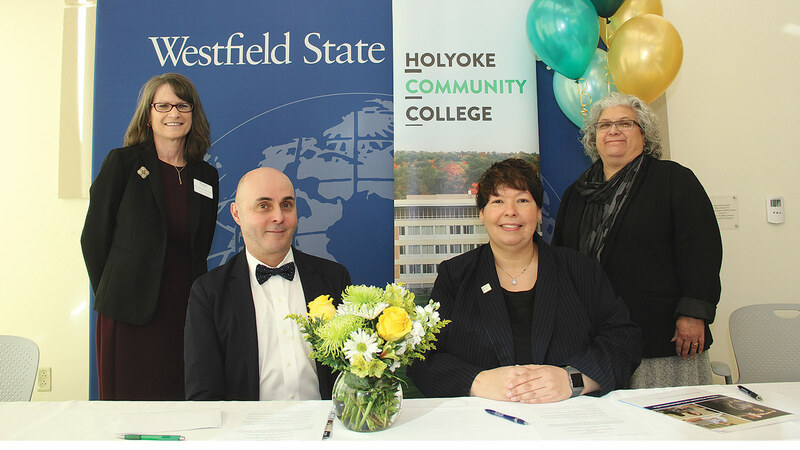 The HCC division of Business and Community Services offered the free ESOL program specifically for residents of Puerto Rico who left the island after Hurricane Maria and relocated to Western Mass. 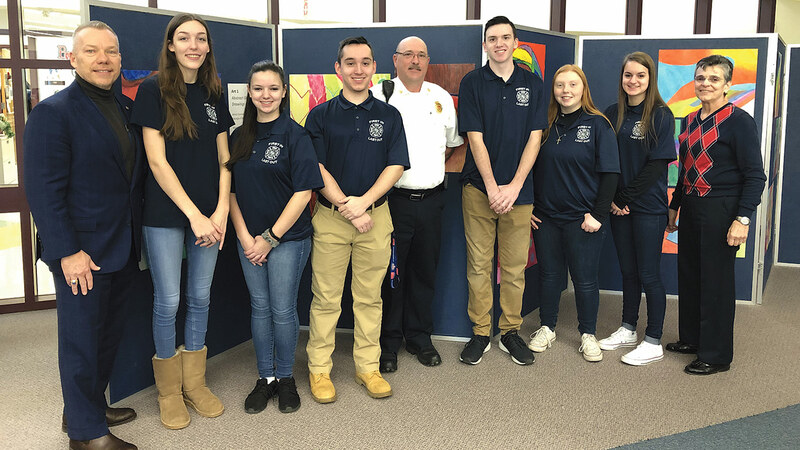 An “Introduction to Fire Science” elective class offered at Ware High School and taught by Ware Fire Department Deputy Chief Edward Wloch — one example of project-based learning at the high school — led to an opportunity to take an EMT-B class at the Holyoke Community College satellite located at the Education to Employment (E2E) site in Ware. 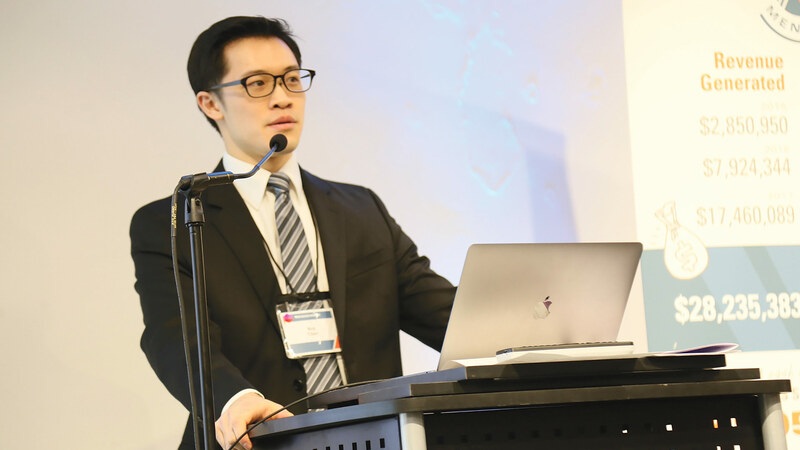 Students who finished the high-school elective are now exploring careers in fire science and emergency medicine. 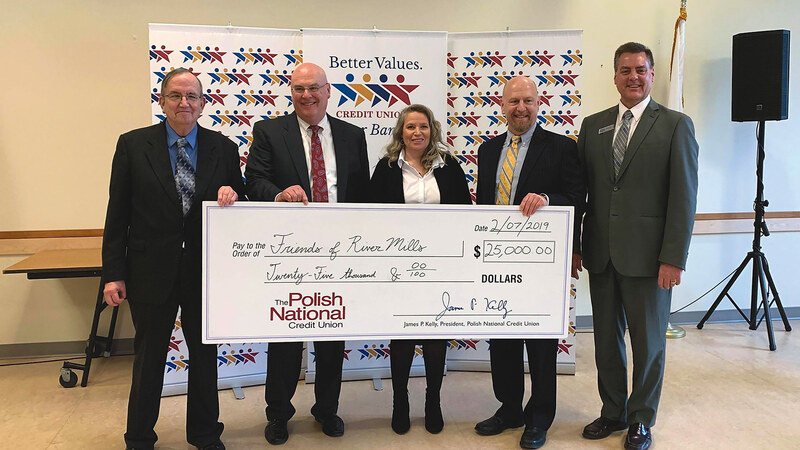 Area business partners included Baystate Wing Hospital Corp., which provided a matching grant of $640 that covered half the tuition and textbooks for the EMT course. 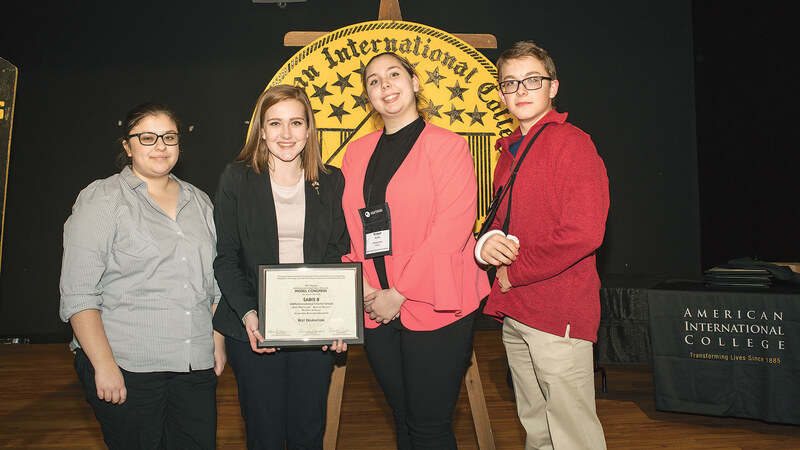 From left: Michael Moran, president of Baystate Mary Lane and Baystate Wing Hospital; students Valentina Towne, Morgan Orszulak, and Joe Gagnon; Wloch; students Seth Bourdeau, Felicity Dineen, and Jordan Trzpit; and Ware Superintendent of Schools Marlene DiLeo. 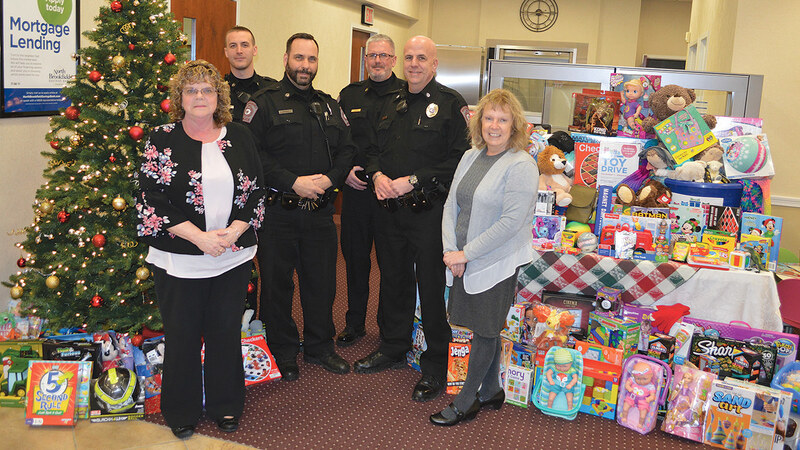 From left: Michael Moran, president of Baystate Mary Lane and Baystate Wing Hospital; students Valentina Towne, Morgan Orszulak, and Joe Gagnon; Wloch; students Seth Bourdeau, Felicity Dineen, and Jordan Trzpit; and Ware Superintendent of Schools Marlene DiLeo. 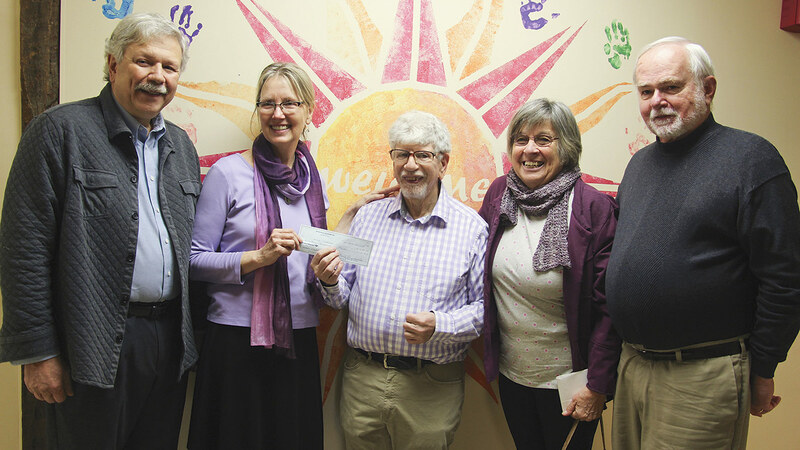 The Advocacy Network, a local organization with a mission to promote and protect the health, human rights, and safety of people with developmental disabilities, recently donated $17,000 to Whole Children. 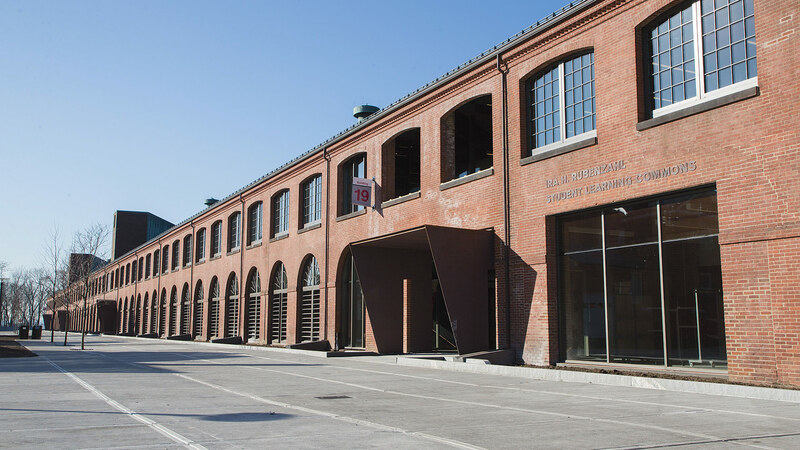 The donation was one of the last acts of the group, which announced it is dissolving after more than 60 years of work. 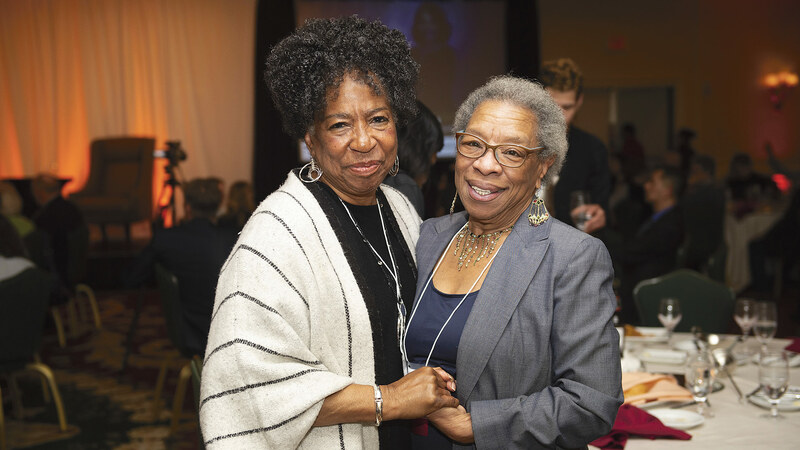 “We’re very pleased to support the programs and staff of Whole Children. 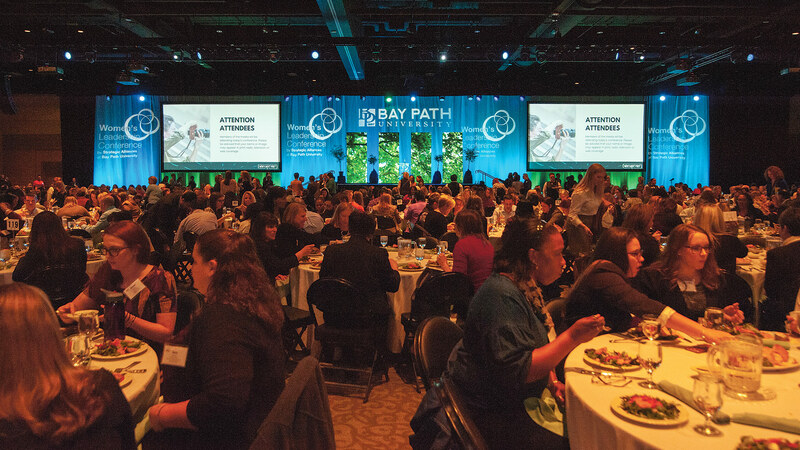 We know we found the right place,” said Advocacy Network board member Ed Orzechowski. 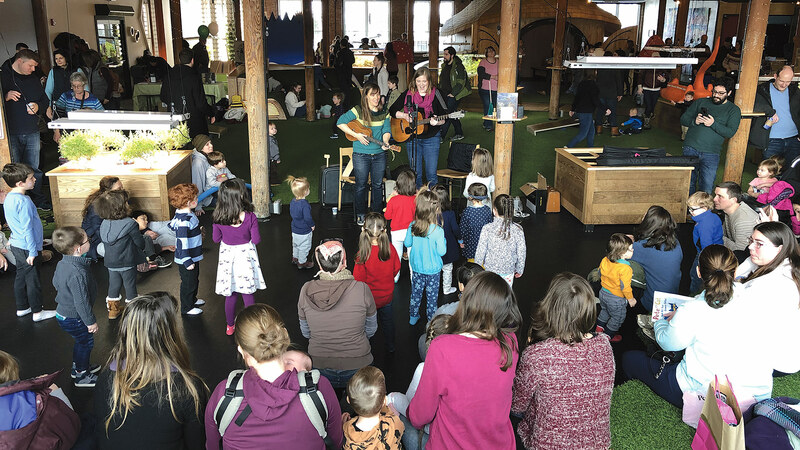 Whole Children was started in 2004 by a group of parents looking for after-school programs for their children with intellectual disabilities or autism. 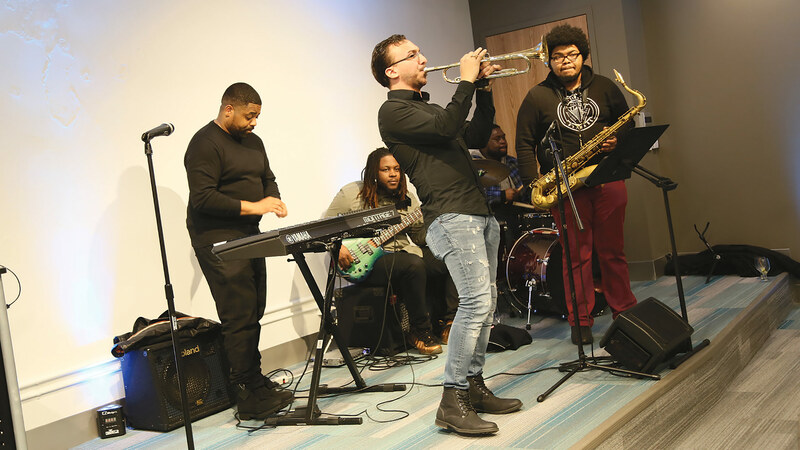 It joined with Springfield-based Pathlight in 2010 and has expanded to serve some 600 adults, teens, and children each year in a variety of recreation, performing-arts, and enrichment programs. 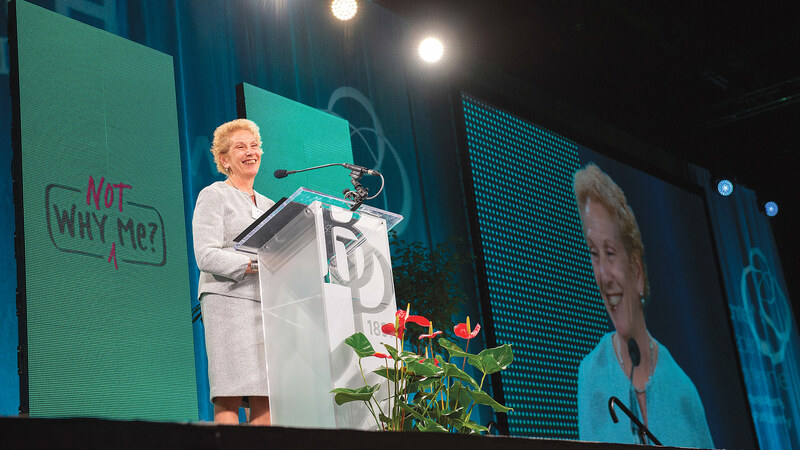 Consolidated Health Plans (CHP), a Springfield-based accident- and health-insurance Berkshire Hathaway company, recently announced the launch of a new brand name and brand identity for three organizations: Consolidated Health Plans, Commercial Casualty Insurance Co., and Atlanta International Insurance Co. 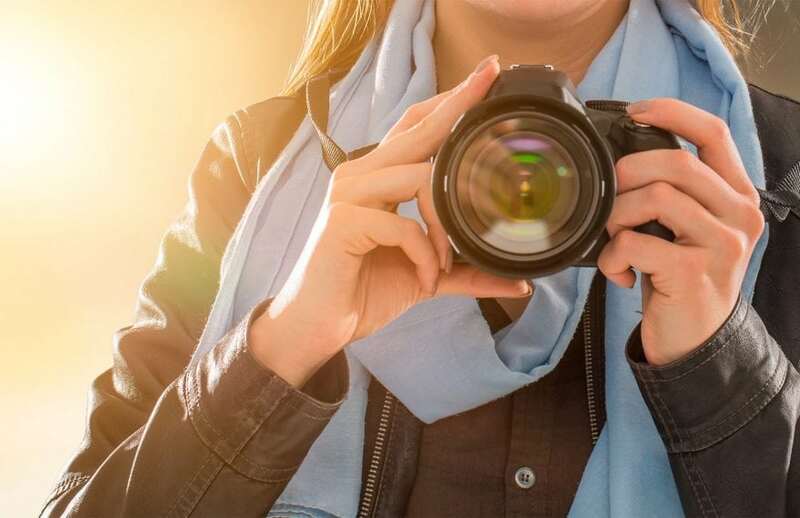 The organizations will be branded under the marketing name of Wellfleet, and the company names are changing to Wellfleet Group, Wellfleet Insurance Co., and Wellfleet New York Insurance Co., respectively. 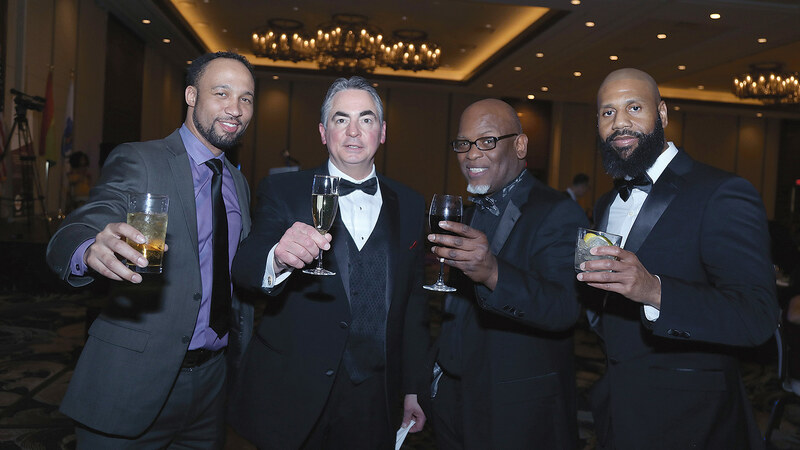 Consolidated Health Plans President and CEO, Drew DiGiorgio, right, with company founder Kevin Saremi at CHP’s recent 25th anniversary celebration at the Basketball Hall of Fame. 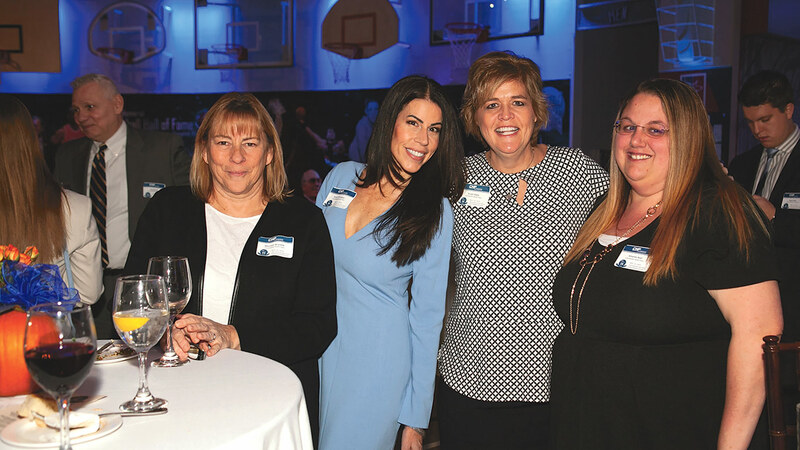 At left: from left, CHP employees Maureen Brunelle, Karen O’Connor, Susan Daley, and Amanda Noel. 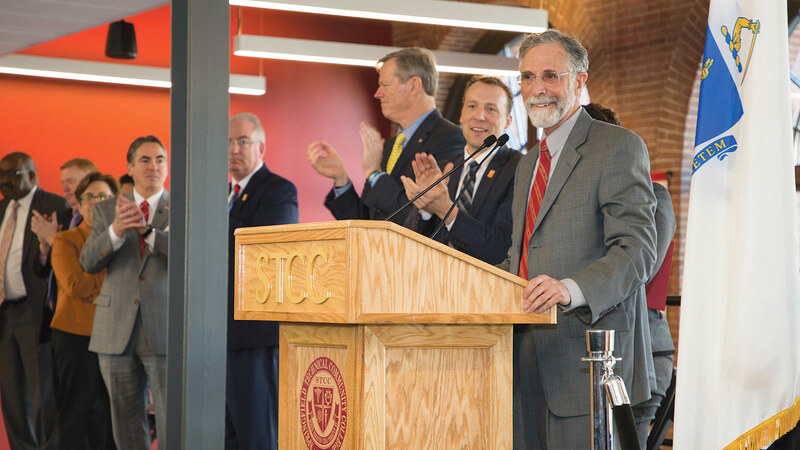 Hundreds of dignitaries, including Gov. 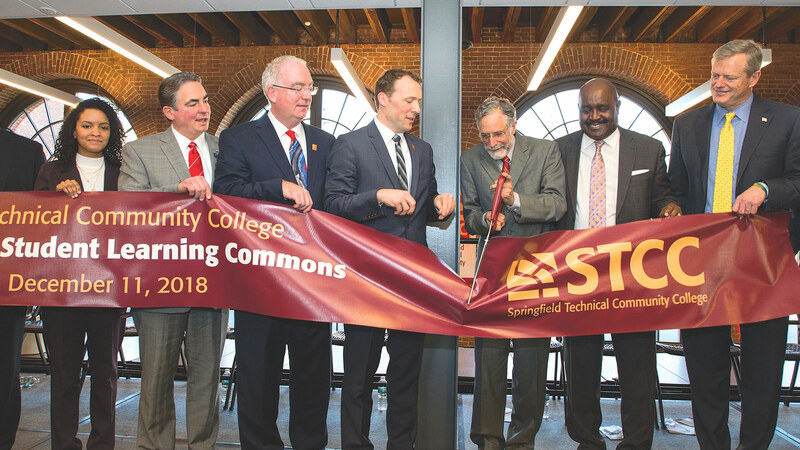 Charlie Baker, joined Springfield Technical Community College administrators, faculty, students, and trustees (past and present) for a ceremonial ribbon cutting for the Ira H. Rubenzahl Student Learning Commons, otherwise known as Building 19 when it was part of the Springfield Armory complex. 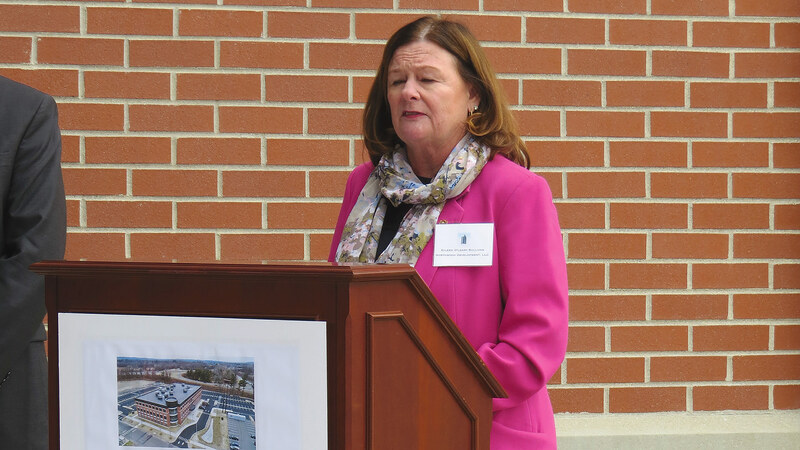 Actually, several speakers who took the podium joked that the $50 million facility should simply be called ‘the Ira’ for short. 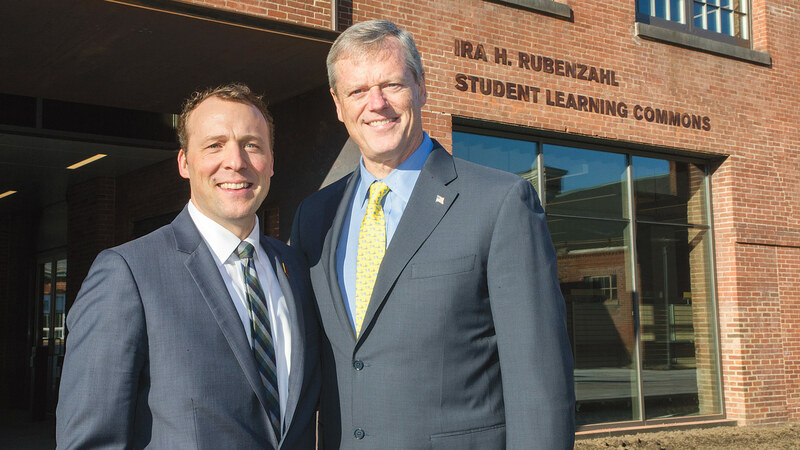 The renovated historic building will now serve as a one-stop hub for student services and activities. 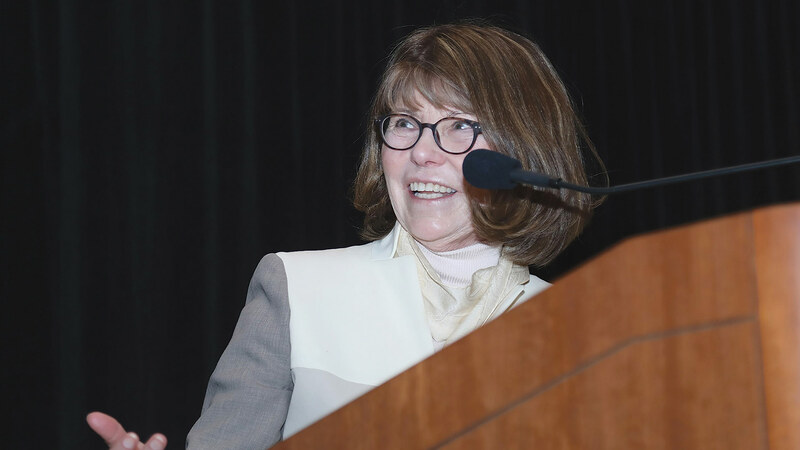 The Massachusetts Bankers Assoc. 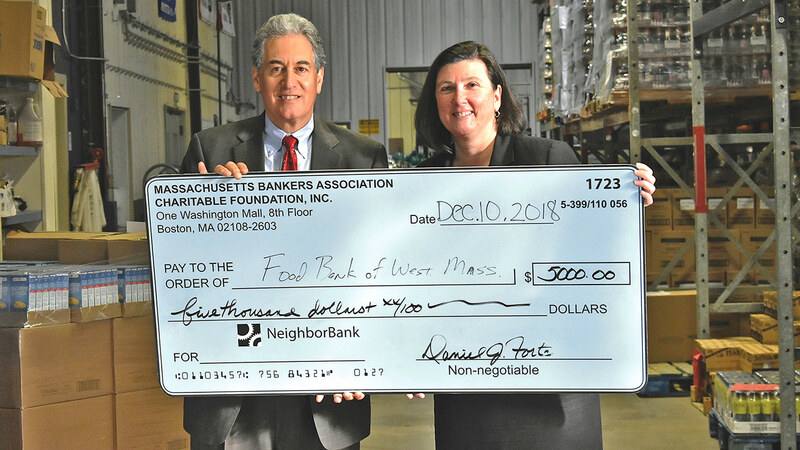 (MBA) announced that the MBA Charitable Foundation set a new record in its annual year-end community grant season. 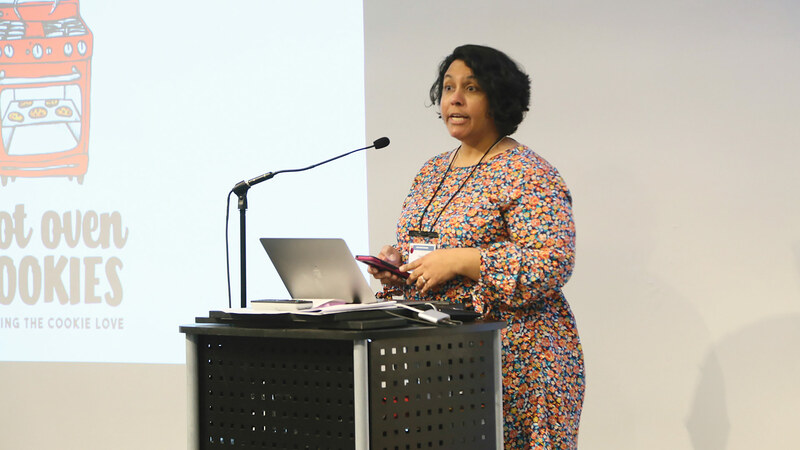 The 45 grants in 2018 total $163,000. 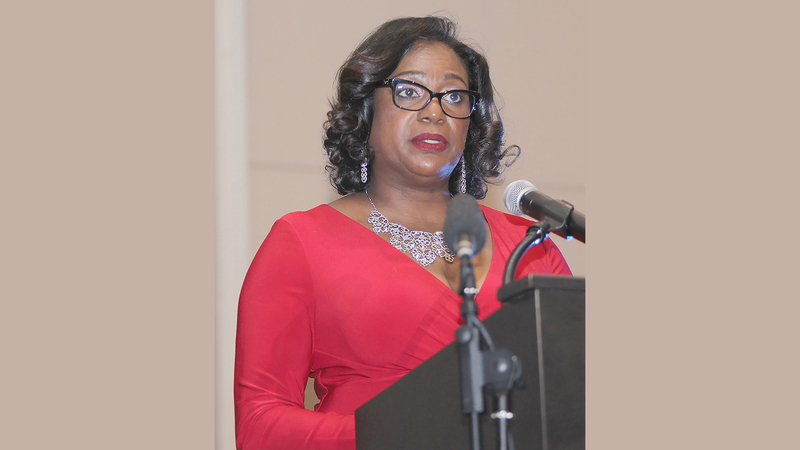 The foundation has now provided gifts totaling approximately $2.5 million over its 22-year history. 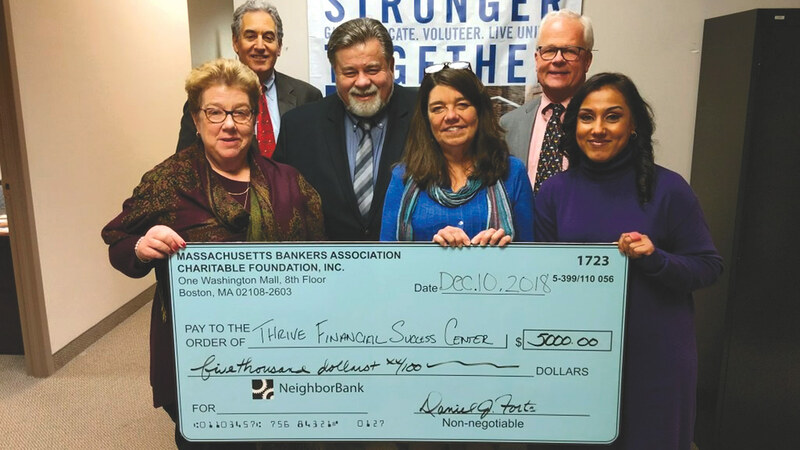 Among the awards is $5,000 to United Way of Pioneer Valley’s Thrive Financial Success Program (below), $5,000 to the Food Bank of Western Massachusetts (middle), and $5,000 to Girls Inc. of Holyoke (bottom). 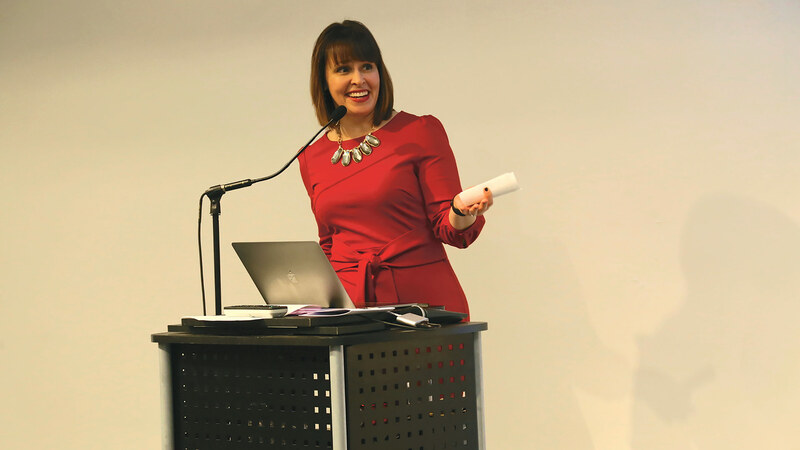 More than 200 women recently attended WillPower Foundation’s “Your Friends Are My Friends” holiday brunch at Hadley Meeting House. 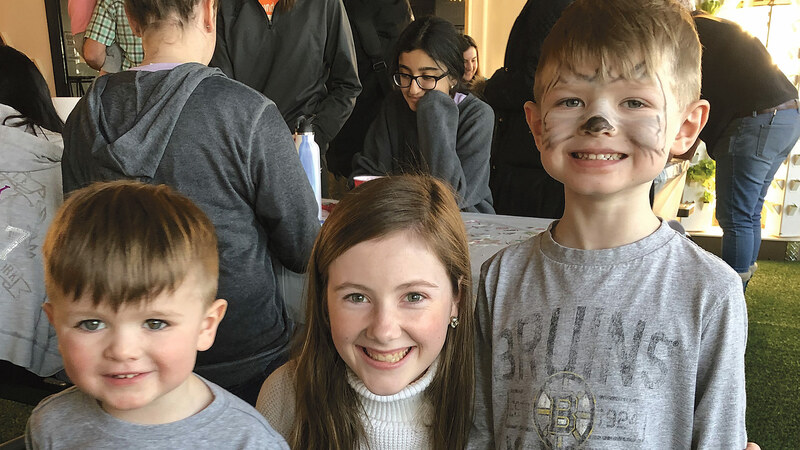 The annual fundraiser raised more than $12,000 for grants for families with loved ones with different abilities throughout Western Mass. 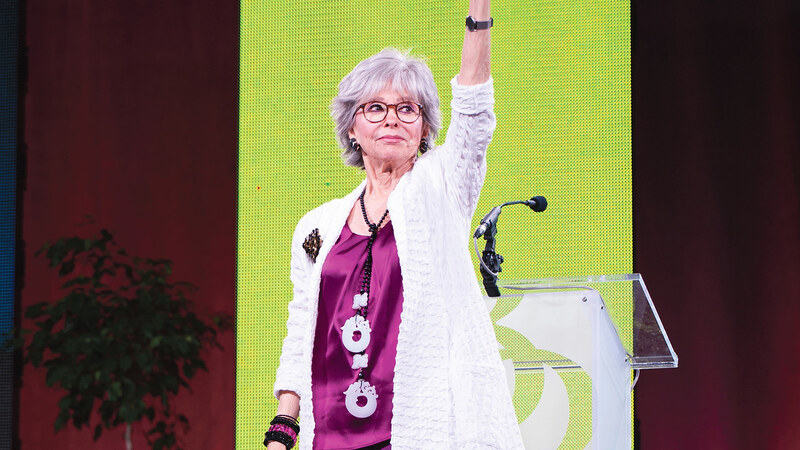 An art auction with pieces created by supporters of WillPower was the highlight of the event. 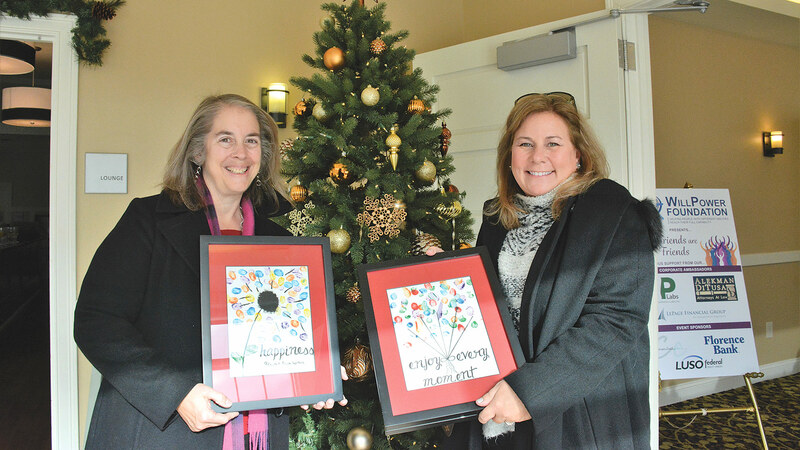 Sharon Dufour of LUSO Federal Credit Union and Kim Anderson with art they won at the auction. 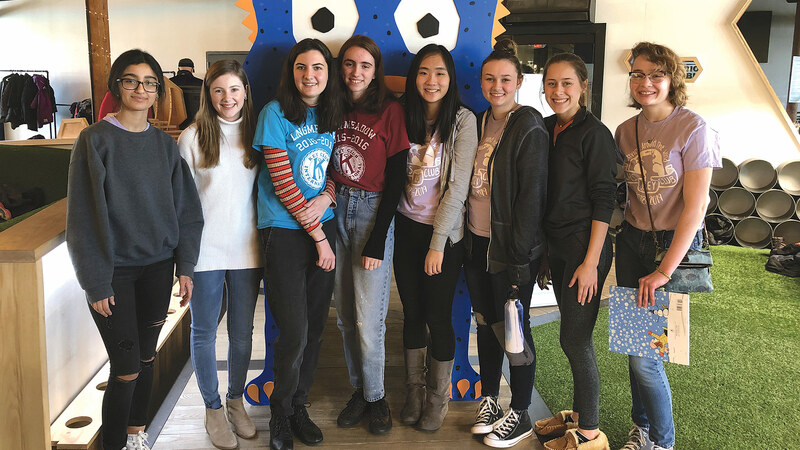 Arrha Credit Union President Michael Ostrowski (pictured at far left) recently recognized Ludlow High School honor students for collecting $7,159.50 in non-perishable food items and donations for Springfield Open Pantry. 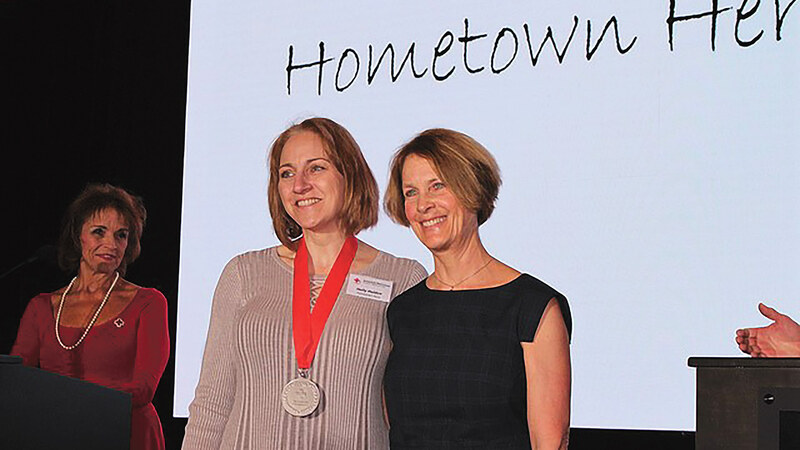 Arrha sponsors the School Challenge, through which area students raised $22,982.91 this year. 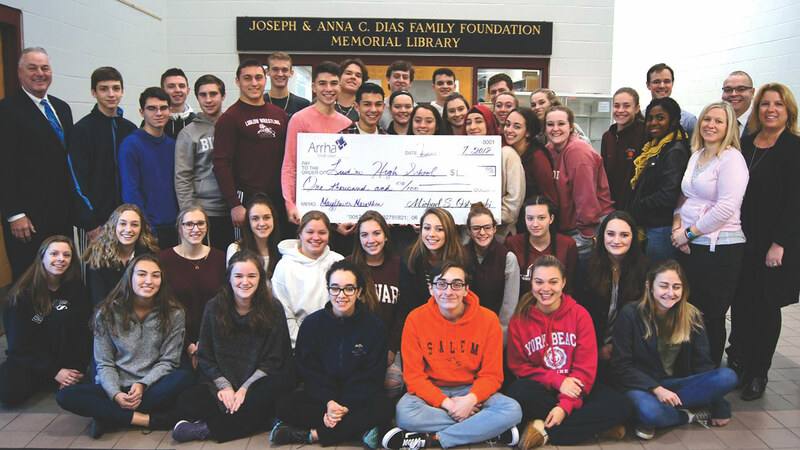 To show appreciation, Arrha donated $1,000 to Ludlow High School community efforts. 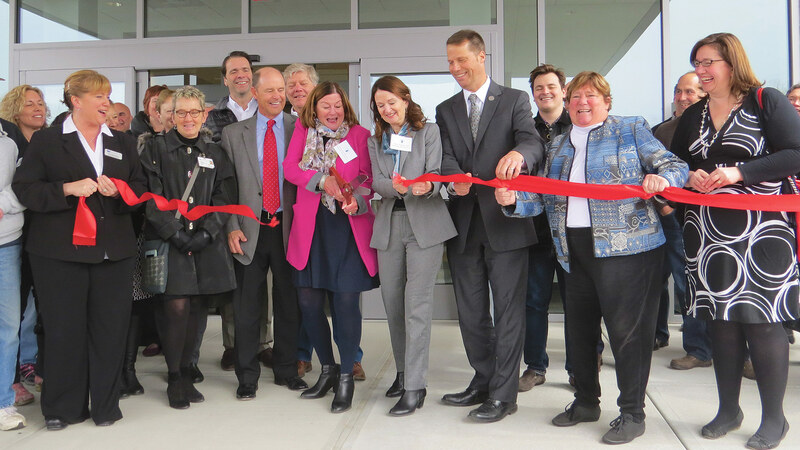 The Springfield Open Pantry is an emergency food kitchen that serves more than 30,000 people each year. 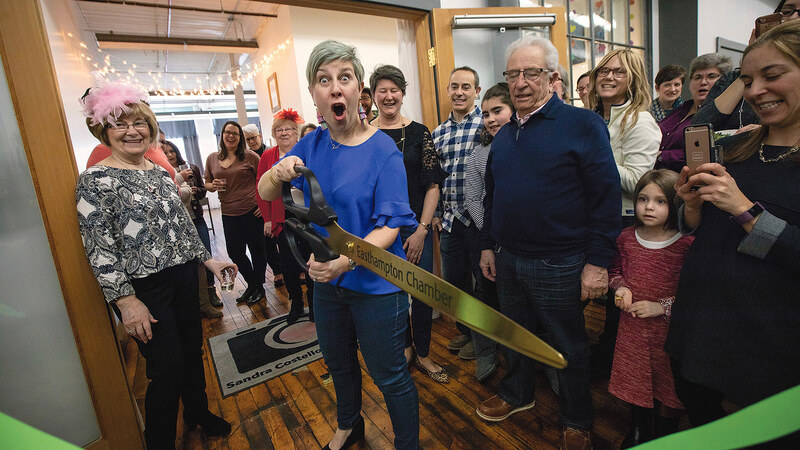 The Greater Northampton, Greater Easthampton and Amherst Area chambers of commerce recently came together for their annual Business Exchange at Lord Jeffery Inn. 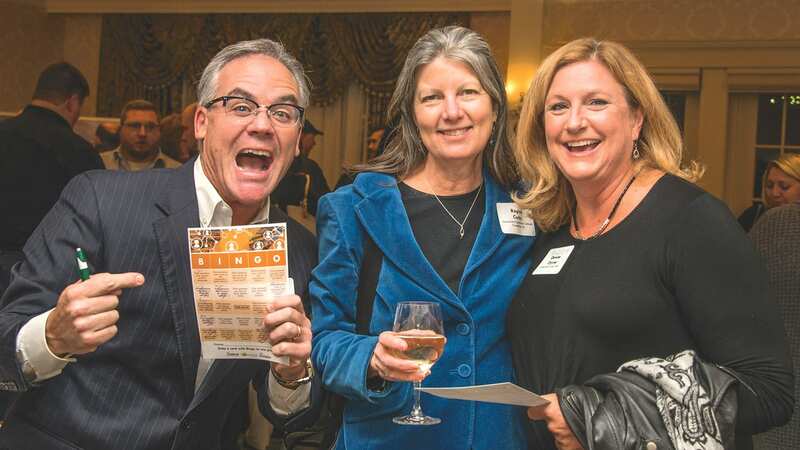 More than 225 business leaders from across the Pioneer Valley enjoyed music, tastings, and networking bingo. 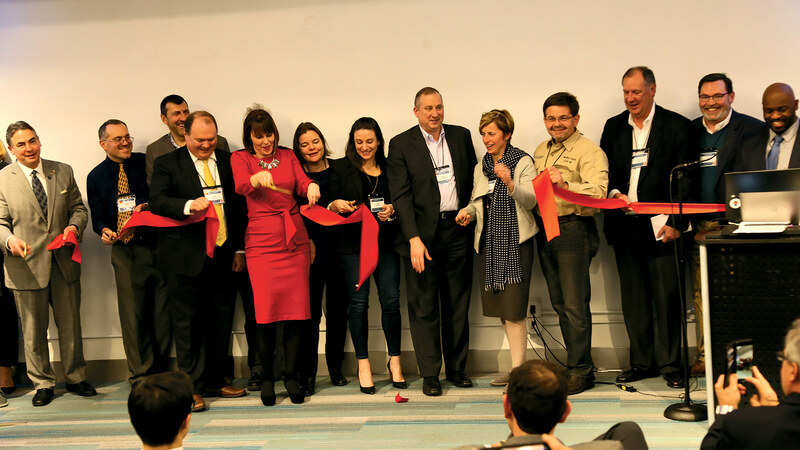 The event was sponsored by Duseau Trucking, Five College Realtors, and Kuhn Riddle Architects. 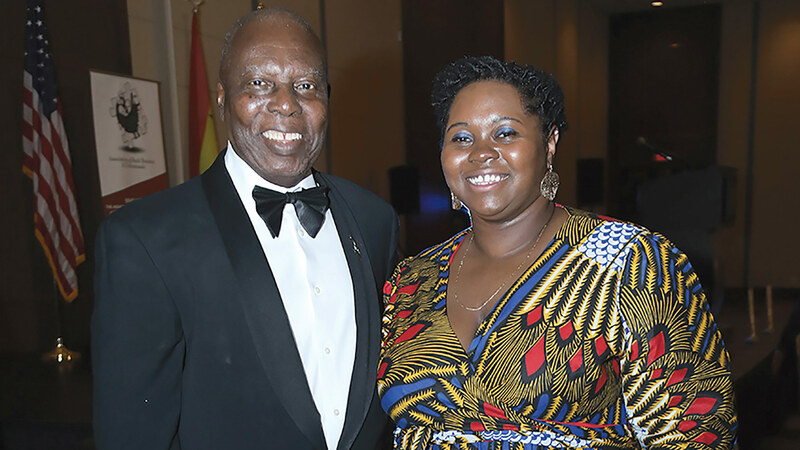 Pictured below: from left, John Howland, President, Greenfield Savings Bank (far left) and his wife Phelicia (far right) with Regina Curtis of the Greenfield Community College Foundation. 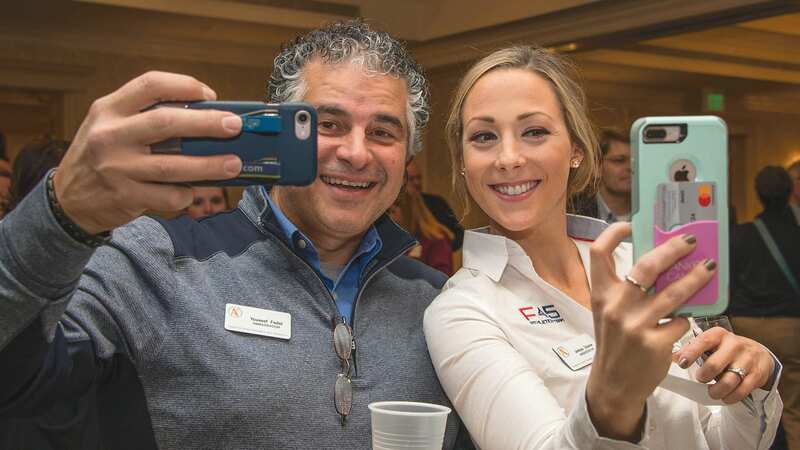 Bottom: Youssef Fadel of New England Promotional Marketing (left) and Jessye Deane of F45 Training of Hampshire Meadows & Community Action. 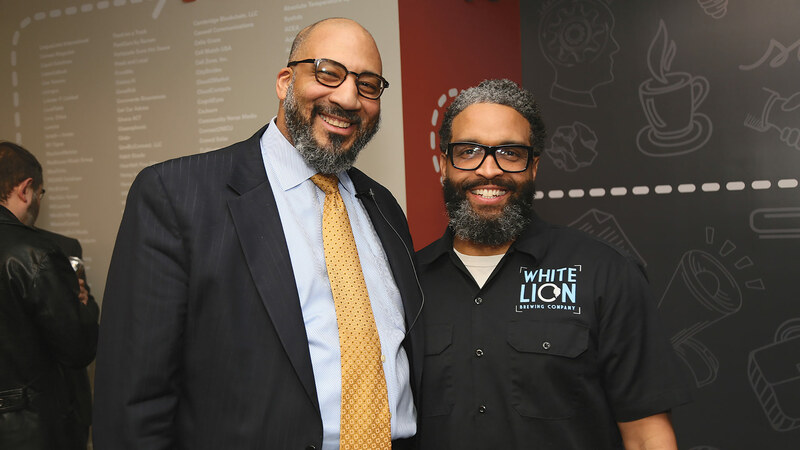 The Springfield College Office of Multicultural Affairs recently presented Leon Ford, a community leader, social activist, and survivor of police brutality. 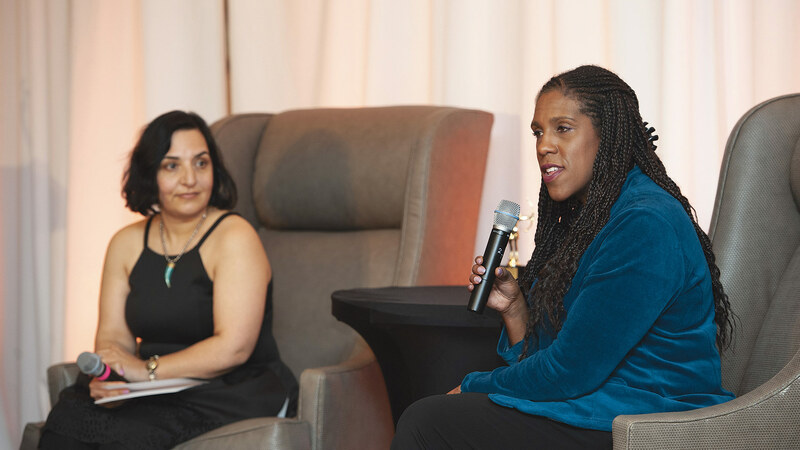 Ford, author of Untold, shared his personal story about police brutality, racial profiling, discriminatory practices, victimization, and how he has used his experience as a tool to positively impact society. 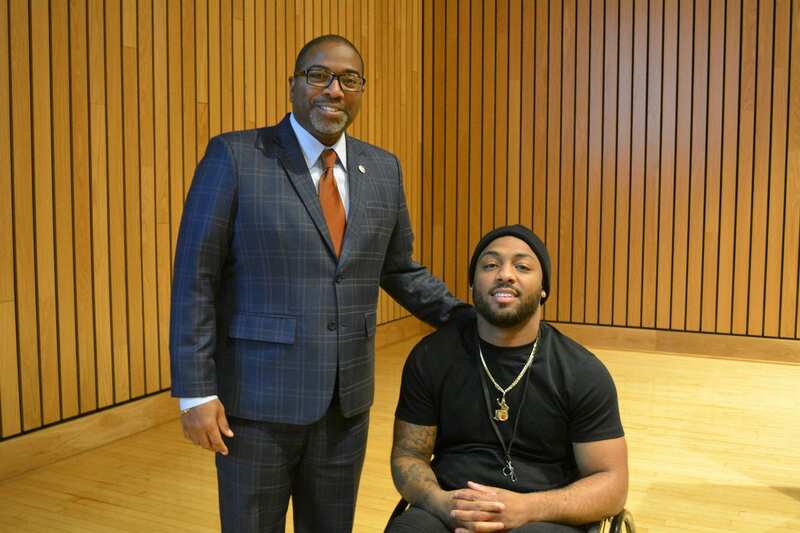 In 2012, Ford, then 19, was shot five times by a Pittsburgh police officer during a routine traffic stop, leaving paralyzed. 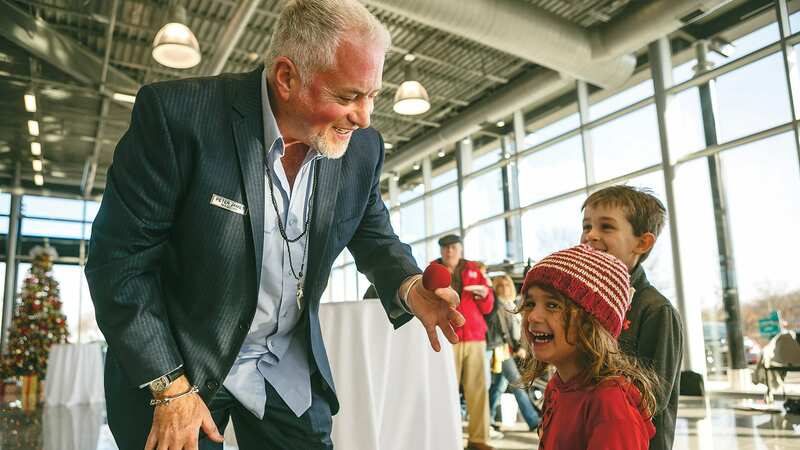 Since that time, Ford has told his story all over the country, including delivering a TEDx Talk, “Turning Pain into Purpose,” about his experiences. 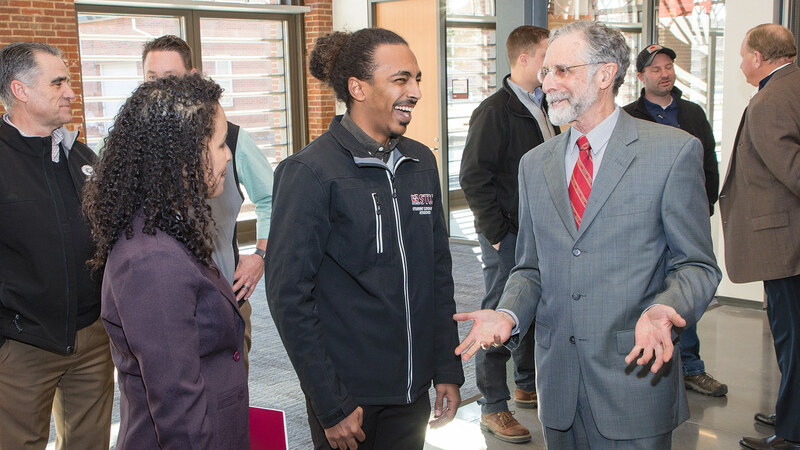 Pictured: Ford (right) with Calvin Hill, Springfield College’s vice president for Inclusion and Community Engagement. 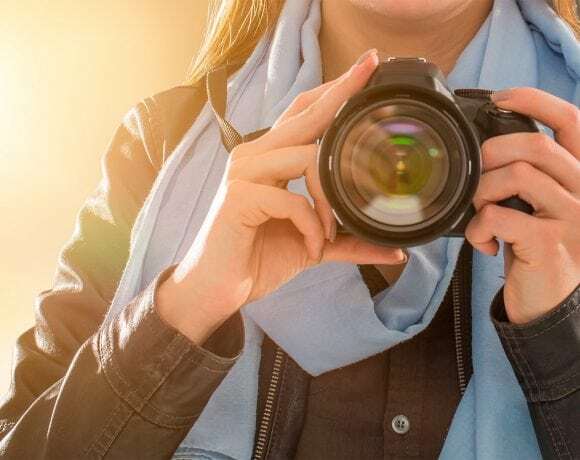 Greater Springfield Senior Services recently awarded $5,000 Let’s Re-engAGE grants to three organizations — Glenmeadow Retirement Community of Longmeadow, Valley Eye Radio Inc. of Springfield, and the Indian Orchard Branch of the Springfield library — for projects designed to reach out to isolated senior citizens and engage the community in the effort. 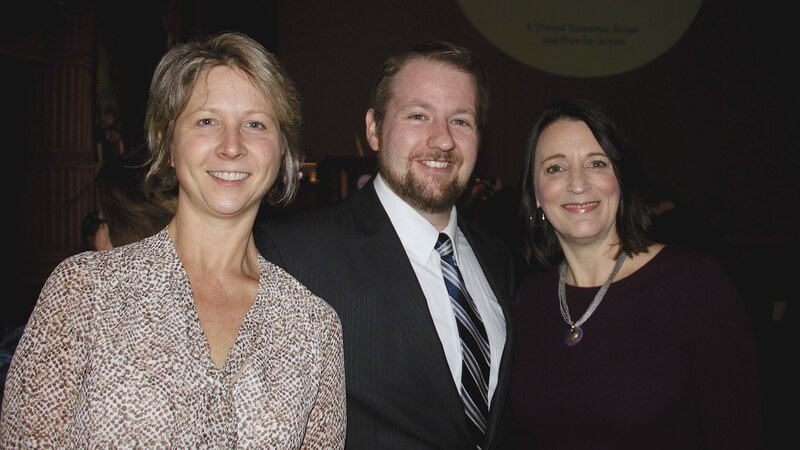 Pictured at below: from left, Valley Eye Radio Executive Director Barbara Loh and board members John Ptaszek and Ellen Berry. 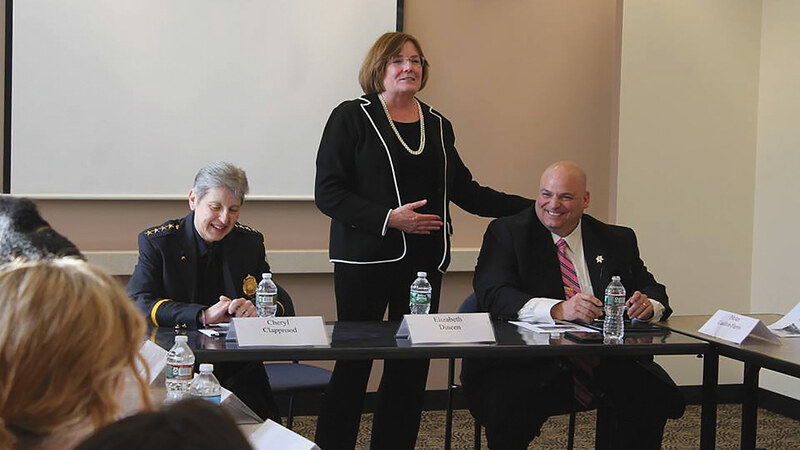 At bottom: from left, Stephen Crane, Longmeadow town manager; the Rev. 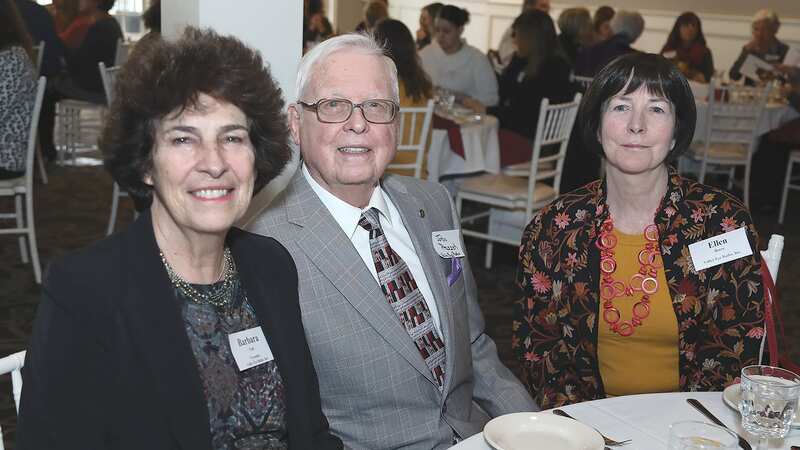 Pam McGrath, First Church of Christ, Longmeadow; Anne Thomas, president and CEO, Glenmeadow Retirement Community; and Erin Koebler, Community Outreach coordinator, Longmeadow Council on Aging. 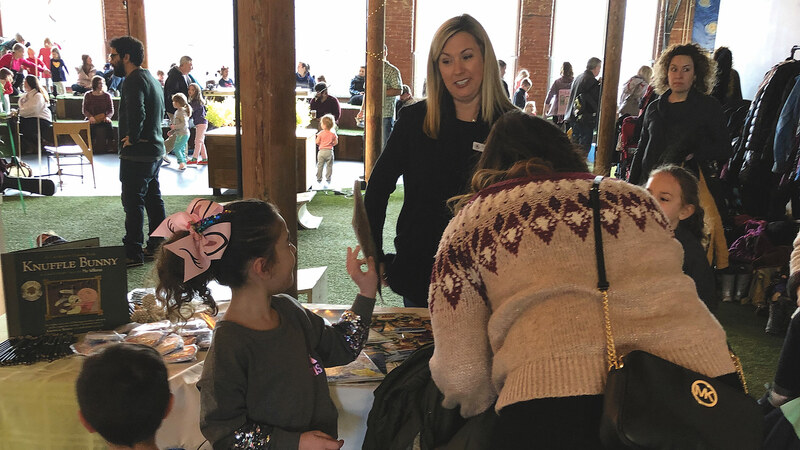 Mercedes Benz of Springfield celebrated its first year in business recently by throwing a party for customers, employees, and partners in the dealership’s many initiatives within the community. 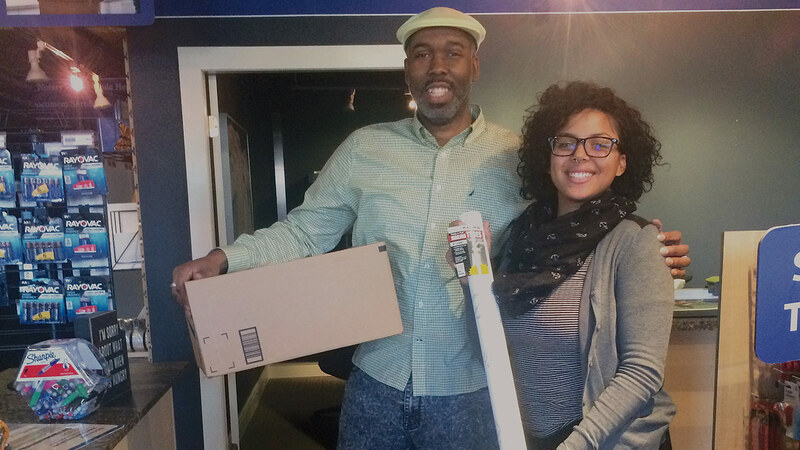 Donations were suggested to support Square One and the Springfield Symphony Youth Orchestra. 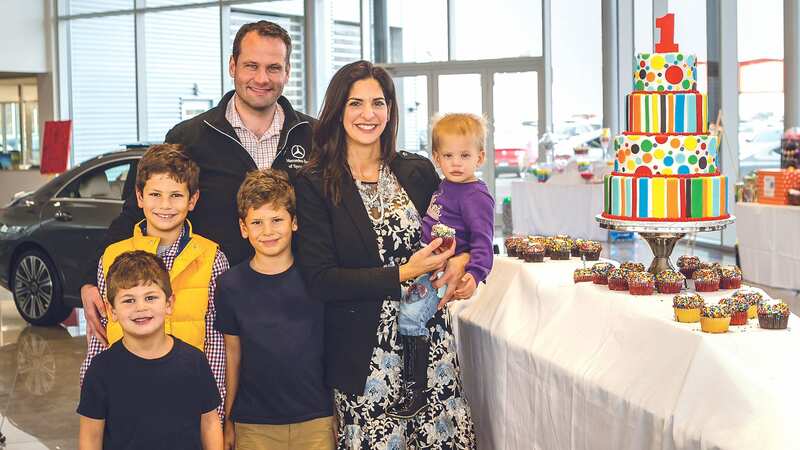 Below, Peter and Michelle Wirth, co-owners of the dealership, with their children: Alexander, Christian, Benjamin, and Charlotte. 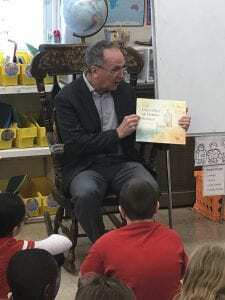 Middle, magician Peter James entertains two young children. 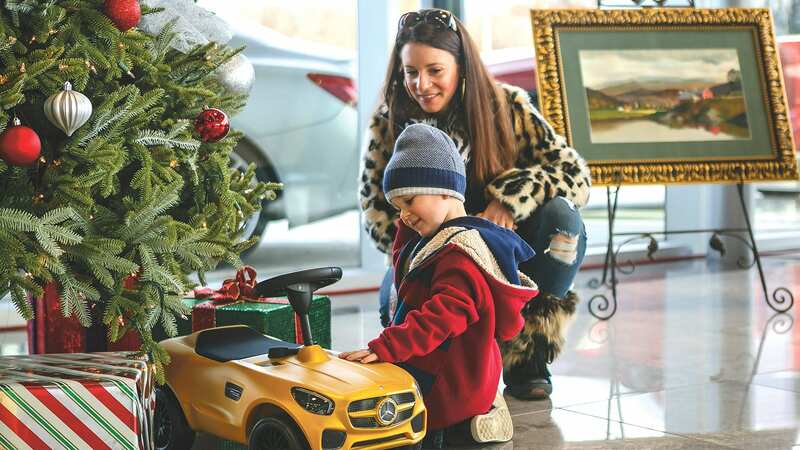 Bottom, there were Mercedes models for people of all ages.